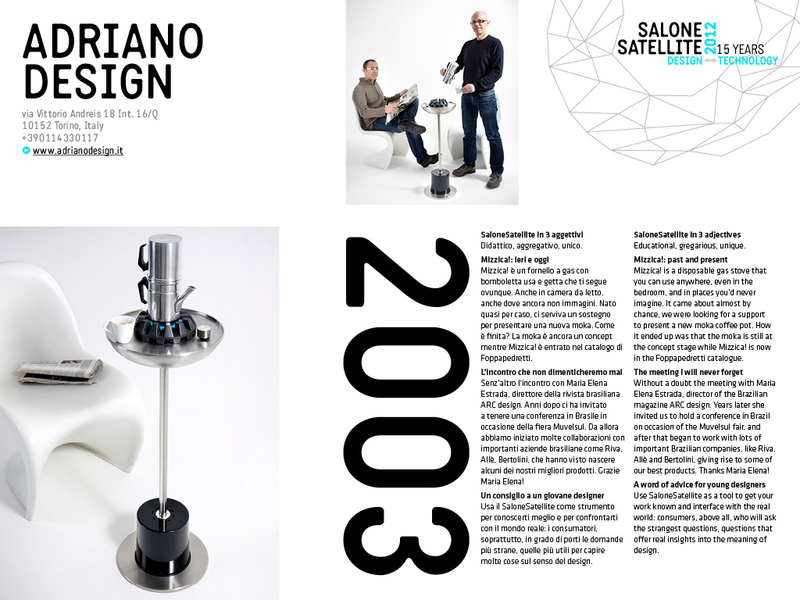 This years Salone Satellite 2012 theme – “Design Technology – a special tribute to Steve Jobs” (who taught us to dream and to believe in the possibilities of technology and creativity) was a fascinating gallery of projects, conceived by 750 young designers ( under 35 ) and included 17 international Schools of Design. 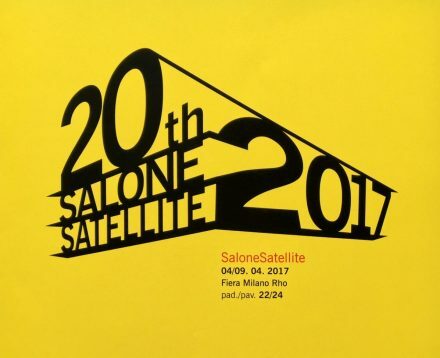 The Salone Satellite means so much to the World, and not just the “Design World,” because here you can find the ideas of the future. 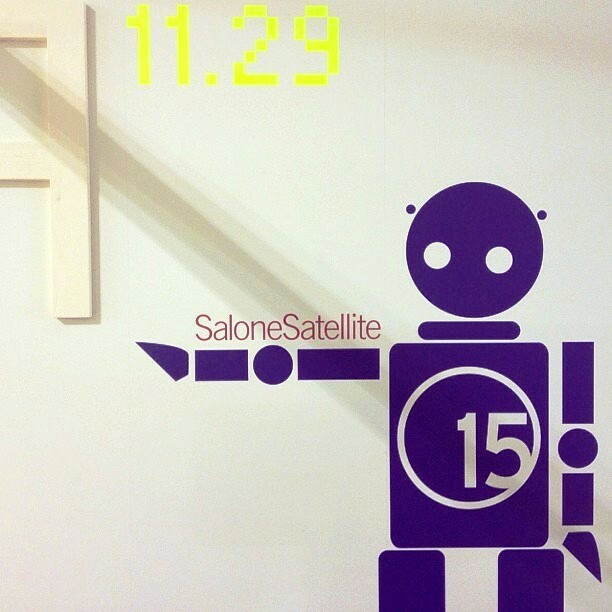 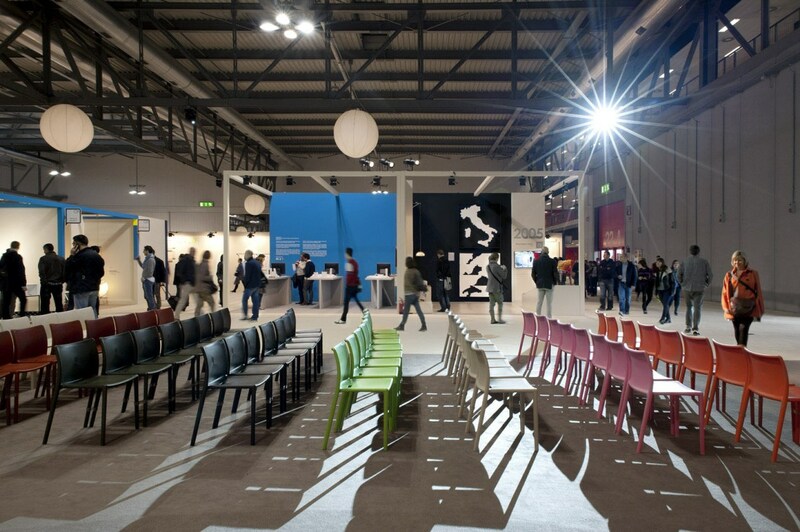 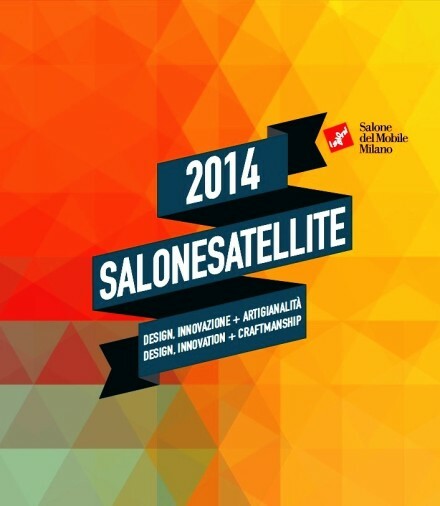 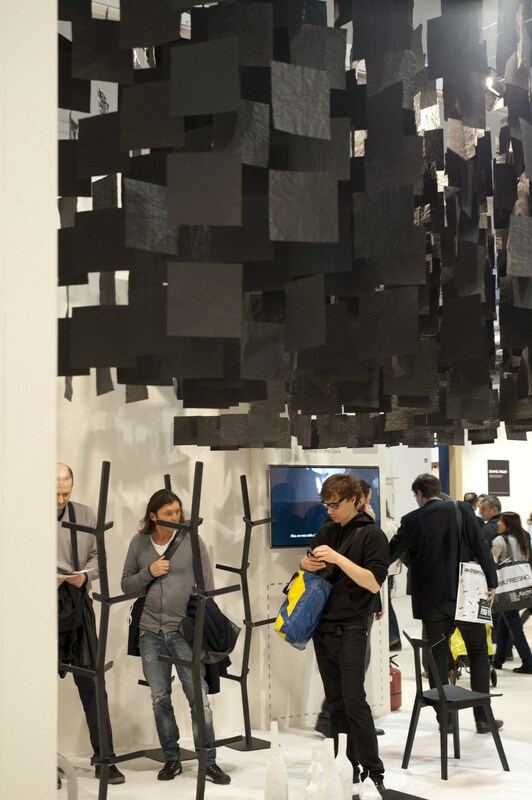 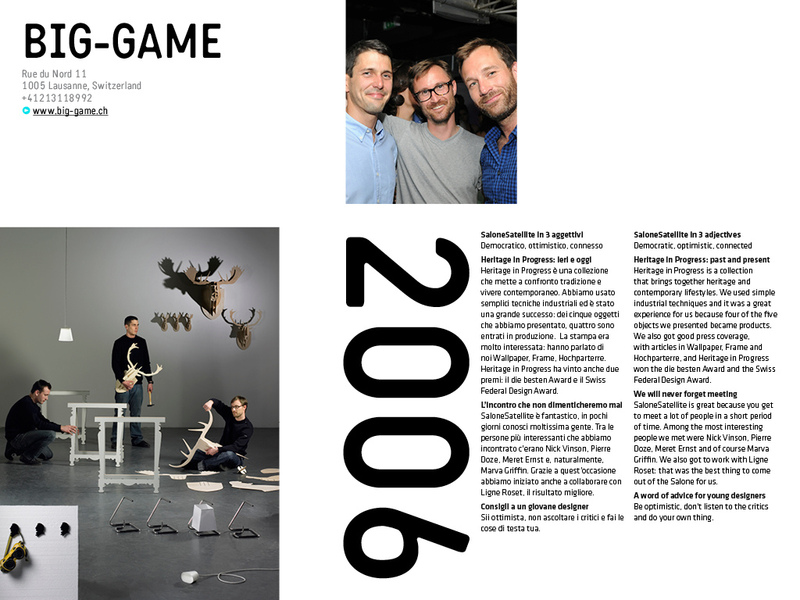 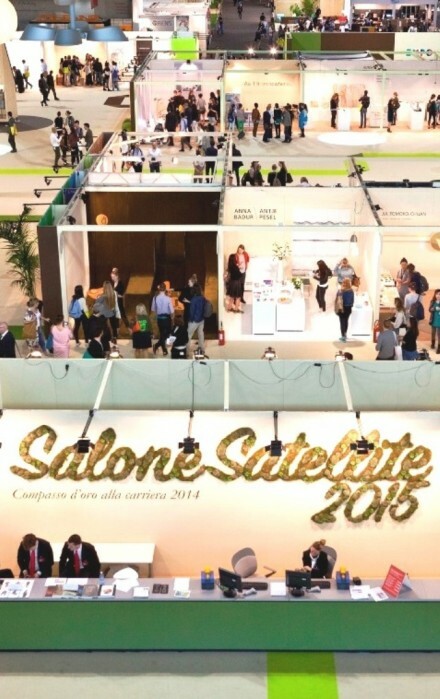 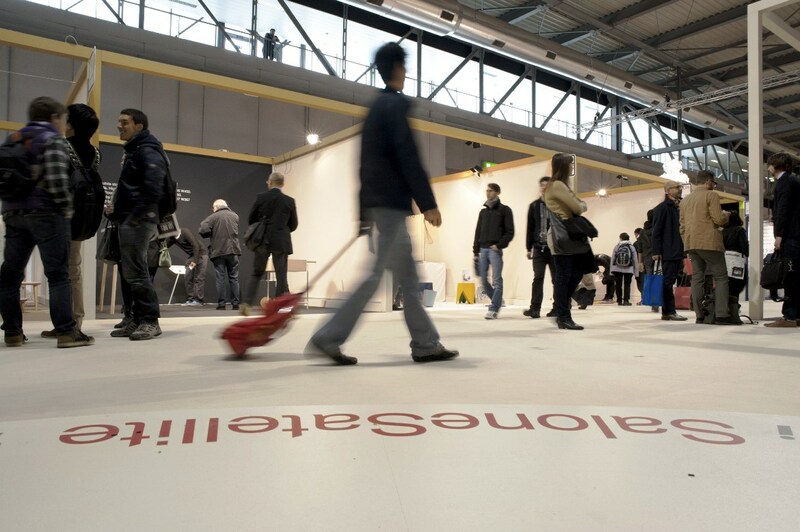 The Salone Satellite immediately became an unparallelled observatory of young international creativity. 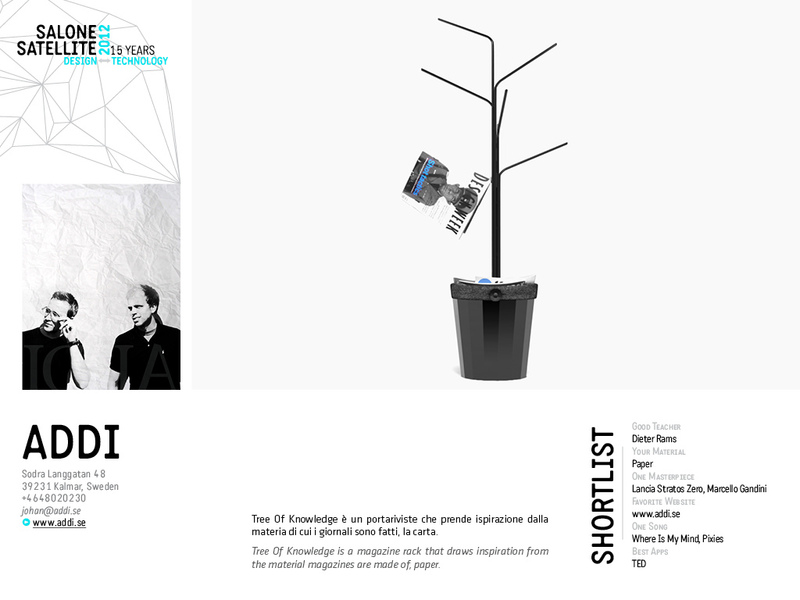 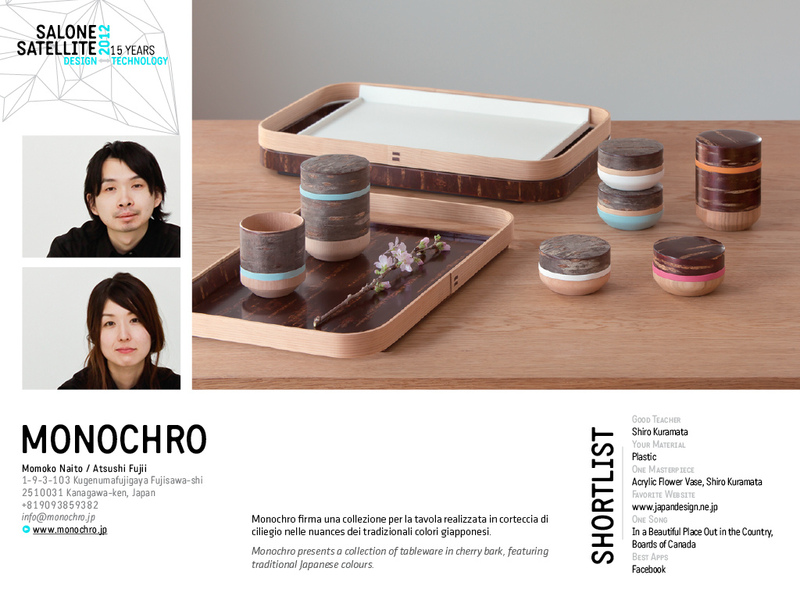 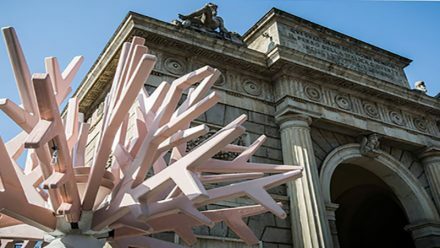 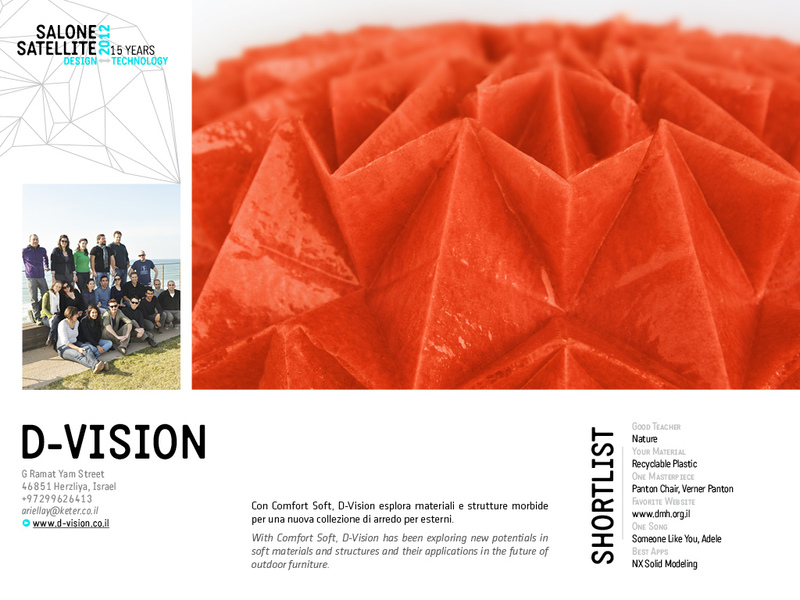 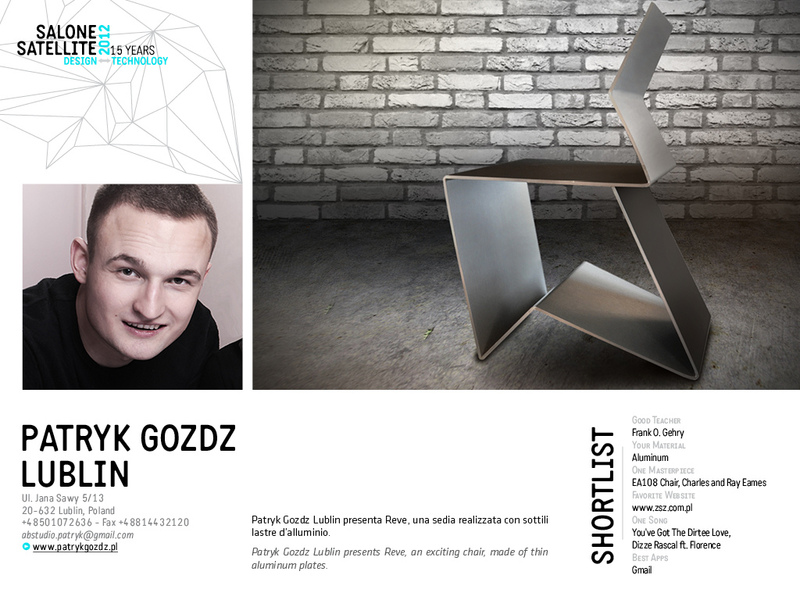 As always, a prestigious Selection Committee composed of key international figures in the world of design, architecture and communication reviewed the proposals of many designers and pared them down to those who participated in the 15th edition. 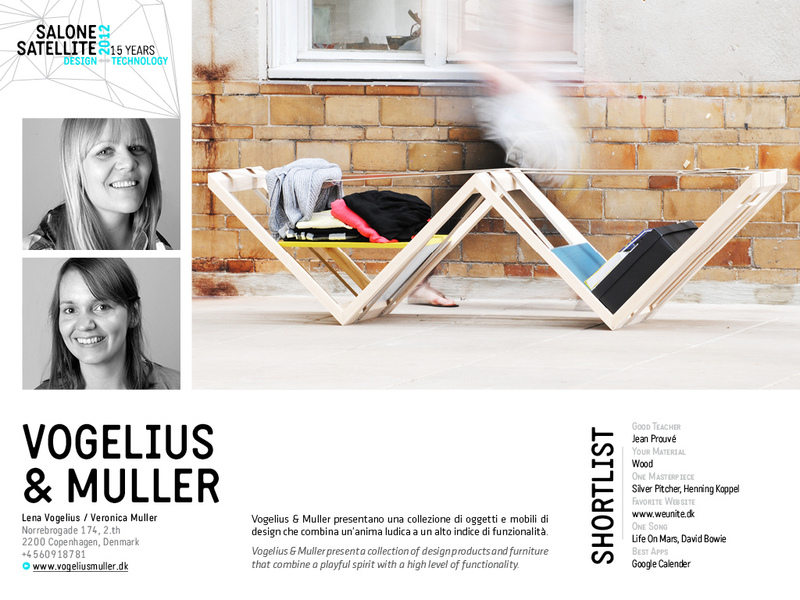 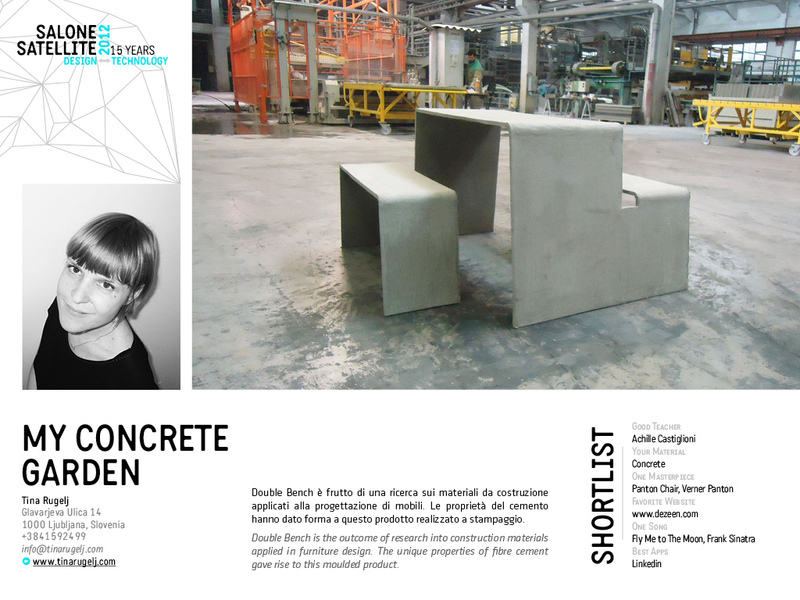 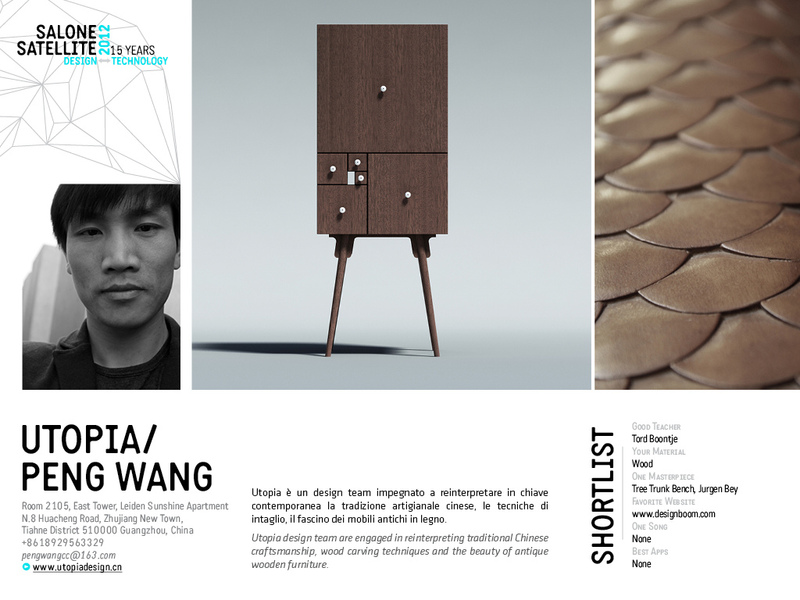 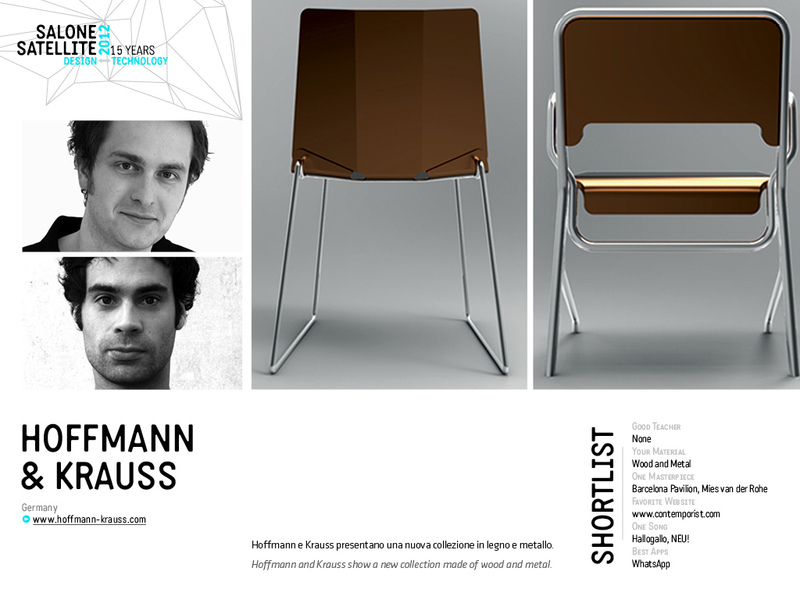 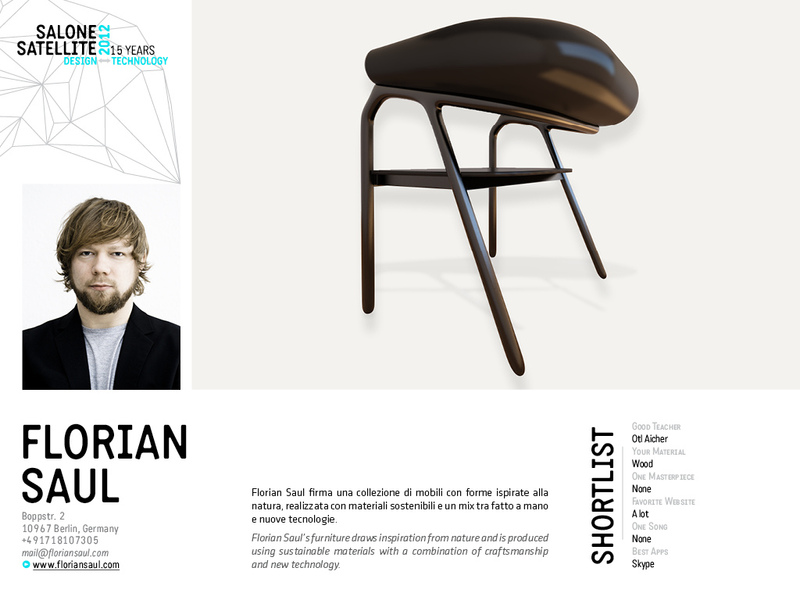 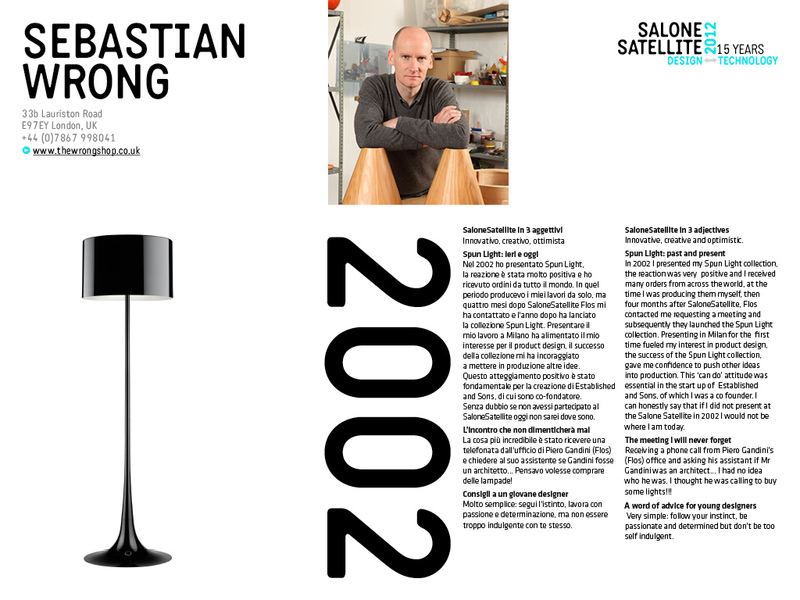 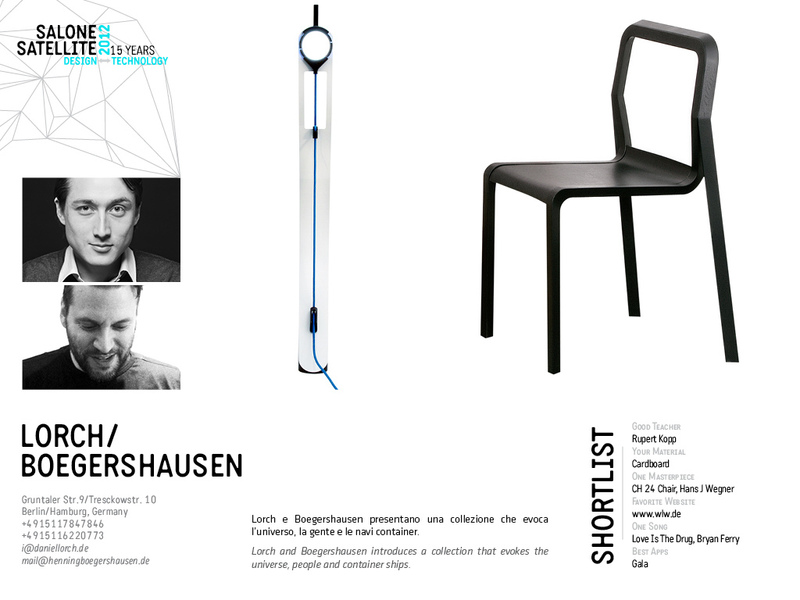 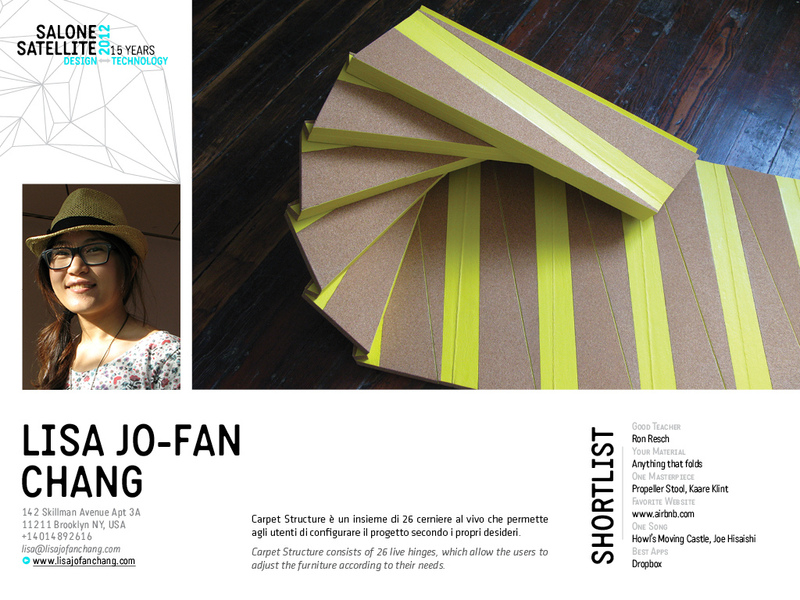 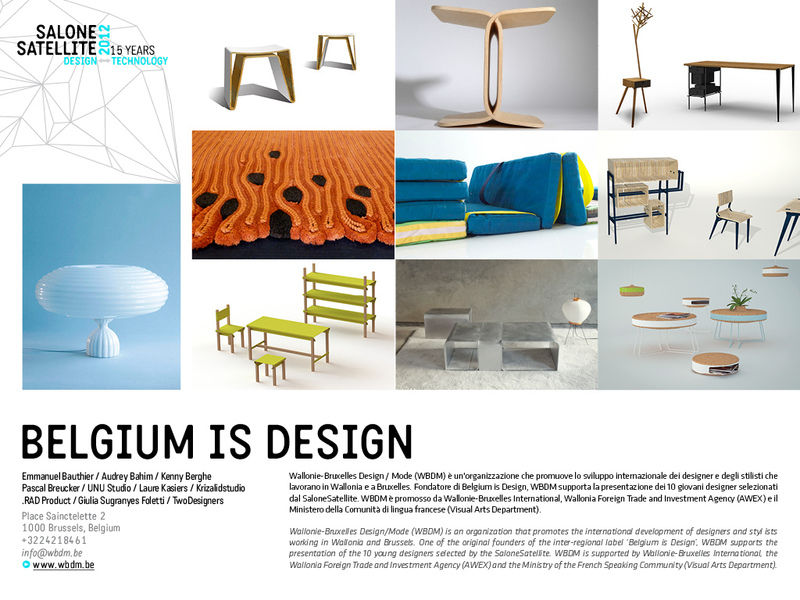 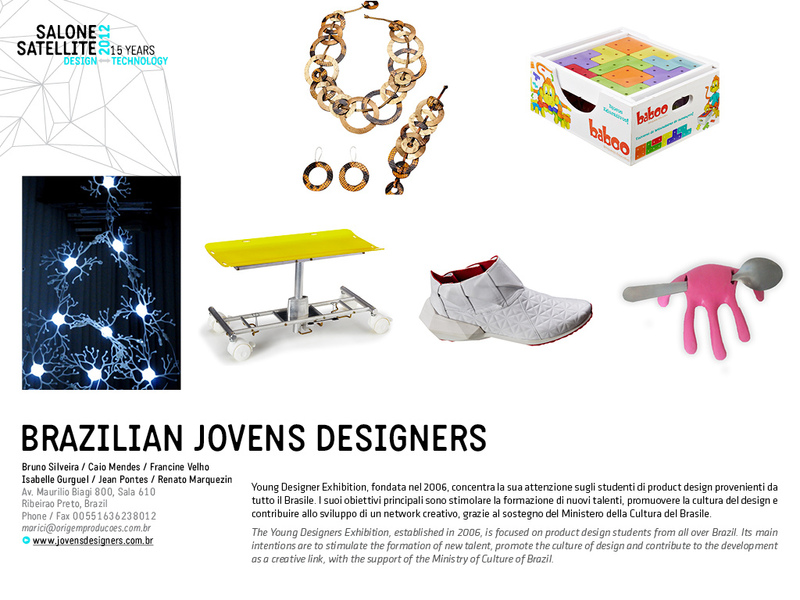 The selection was as competitive as ever, in order to maintain the sterling reputation of the Salone Satellite, the world’s foremost springboard for promising young designers into the marketplace and the design star system. 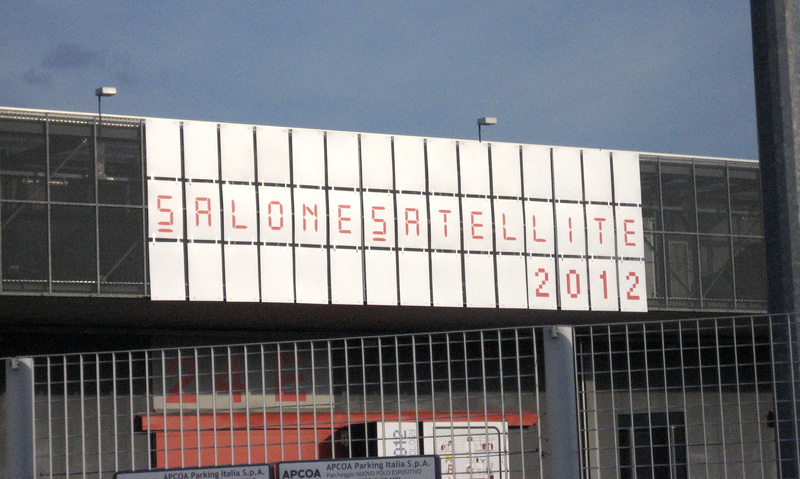 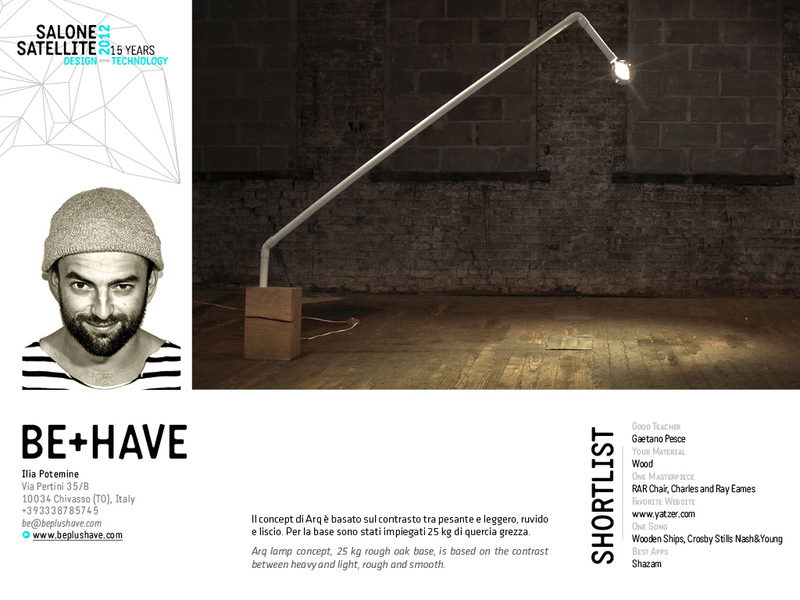 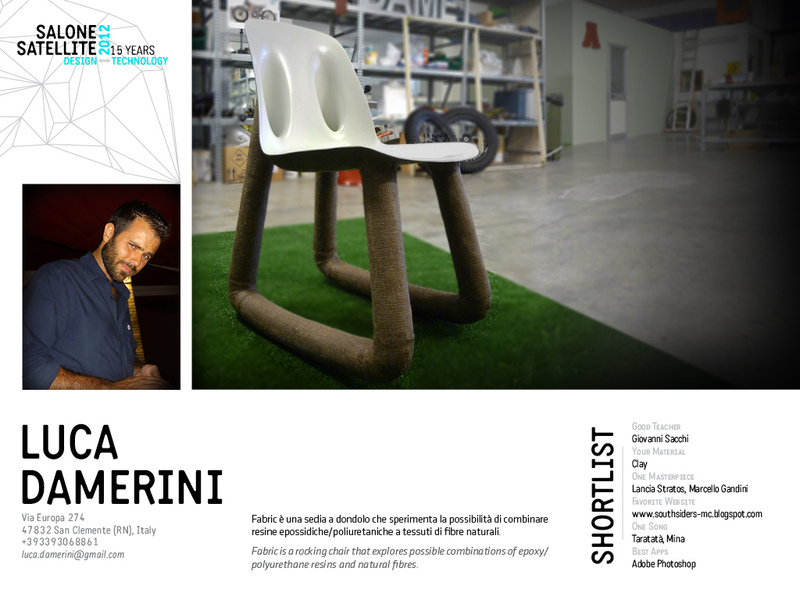 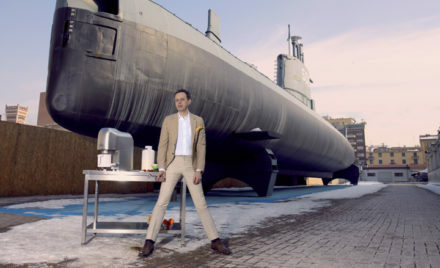 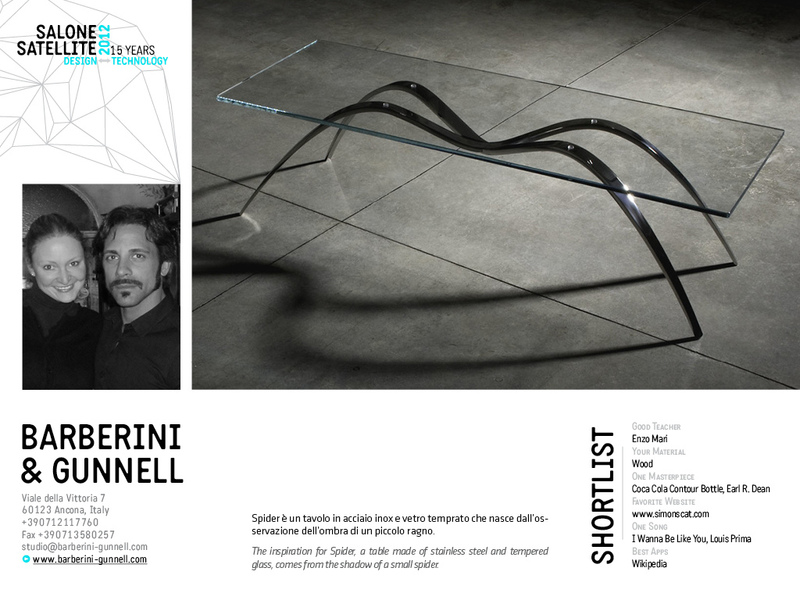 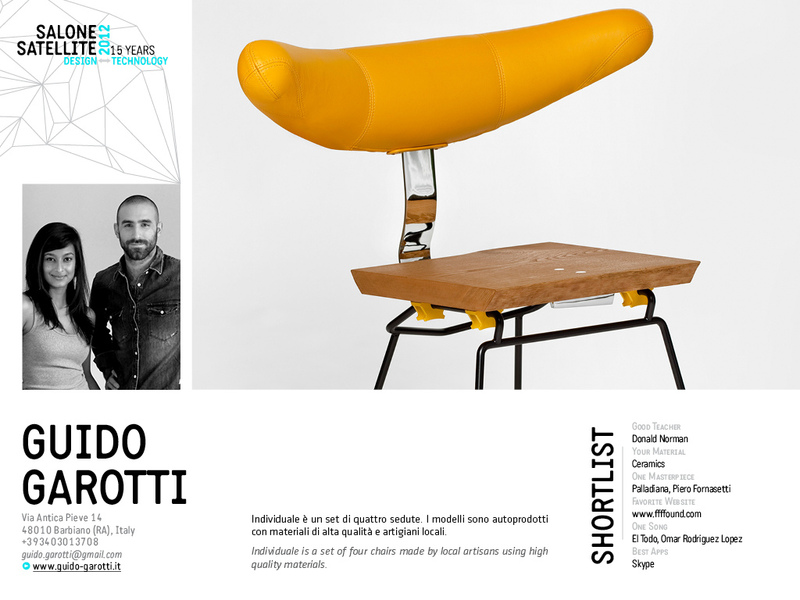 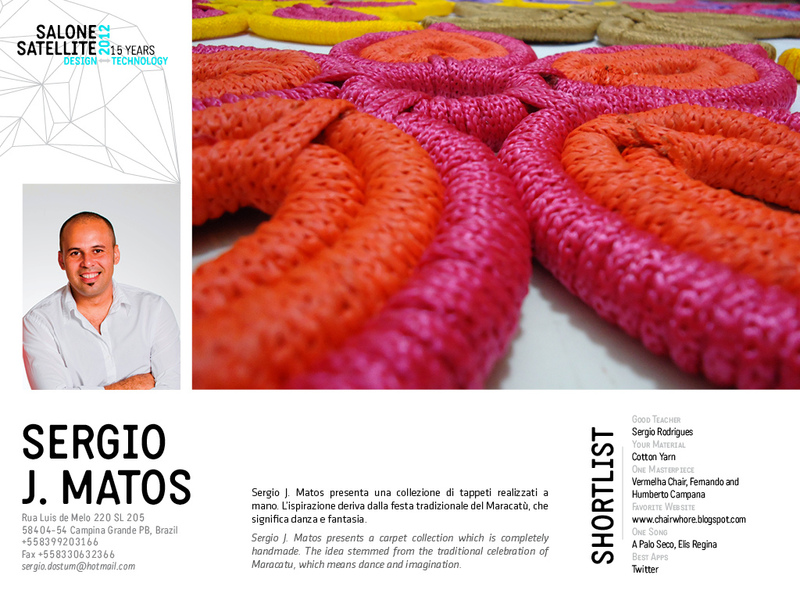 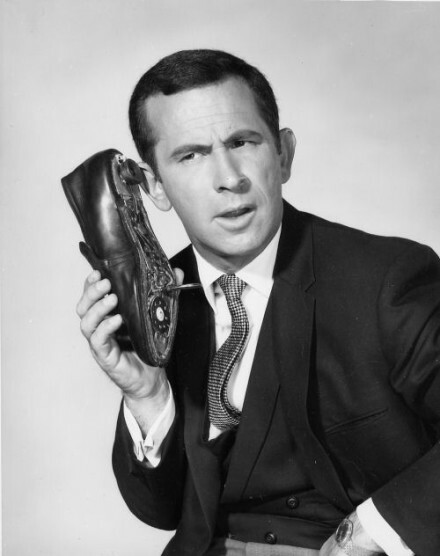 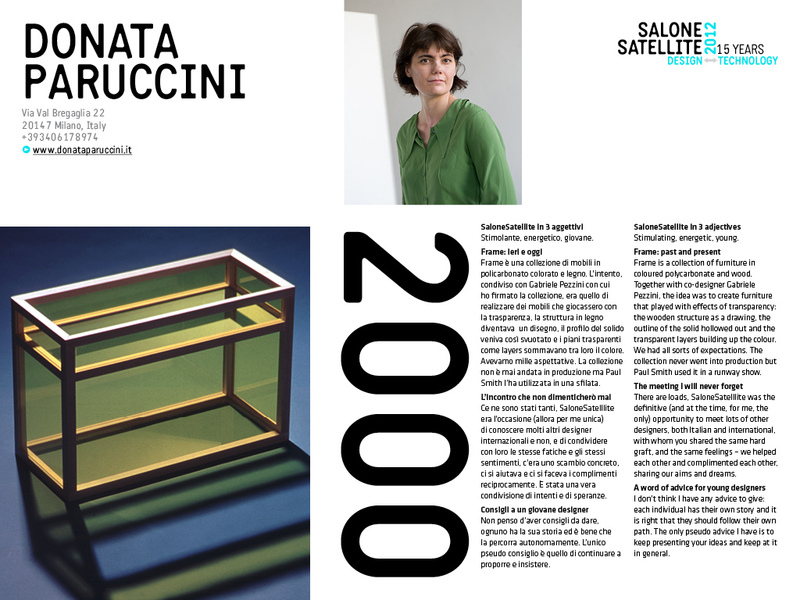 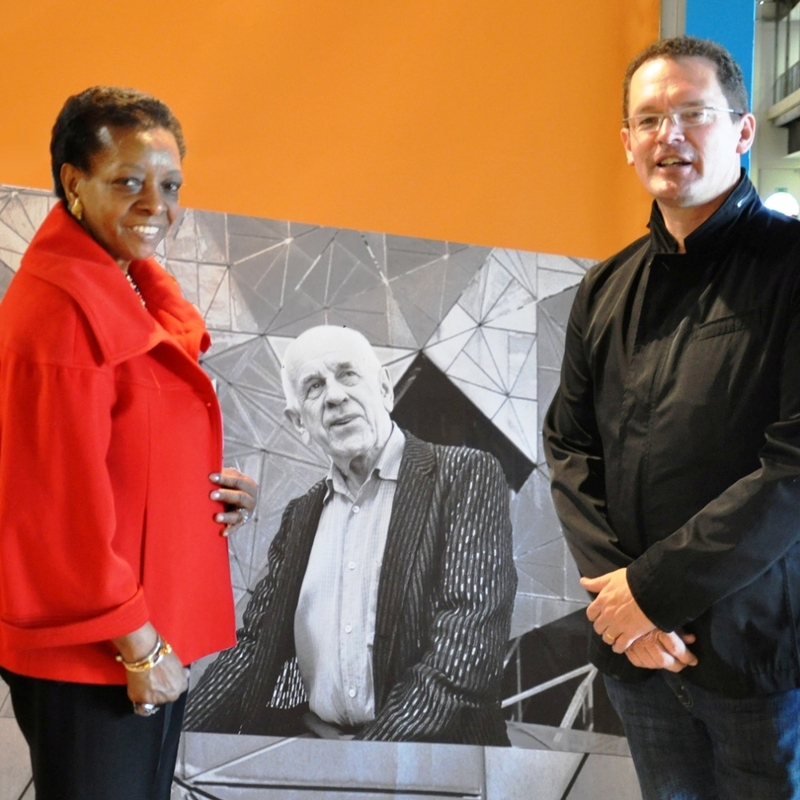 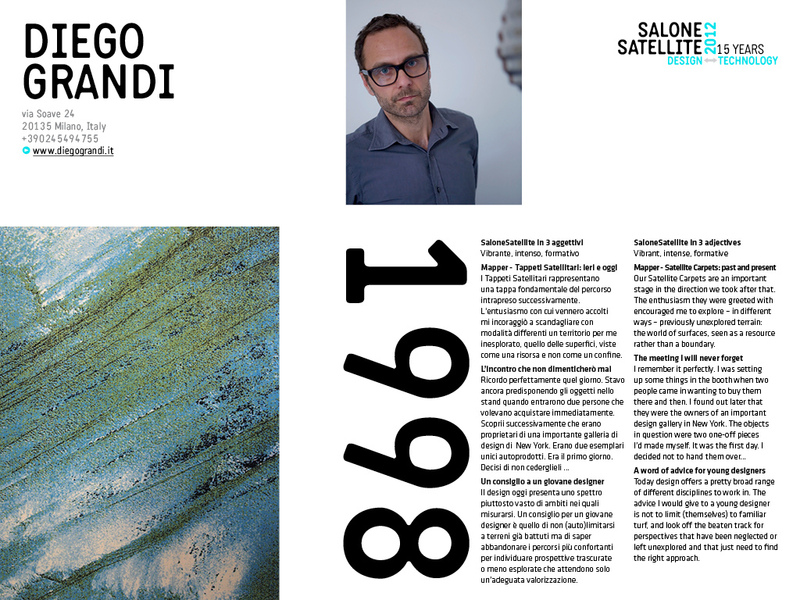 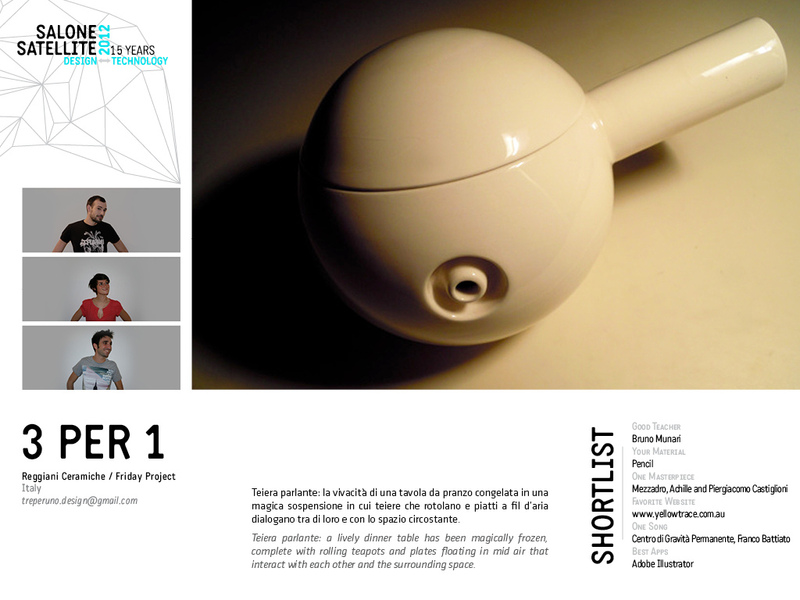 The Satellite Selection Committee has included such luminaries as Giulio Castelli, Italo Lupi, Aessandro Mendini, Paola Antonelli, Philippe Starck, Mario Bellini, Maddalena De Padova, Carlo Guglielmi, Alberto Alessi and Pierluigi Cerri. 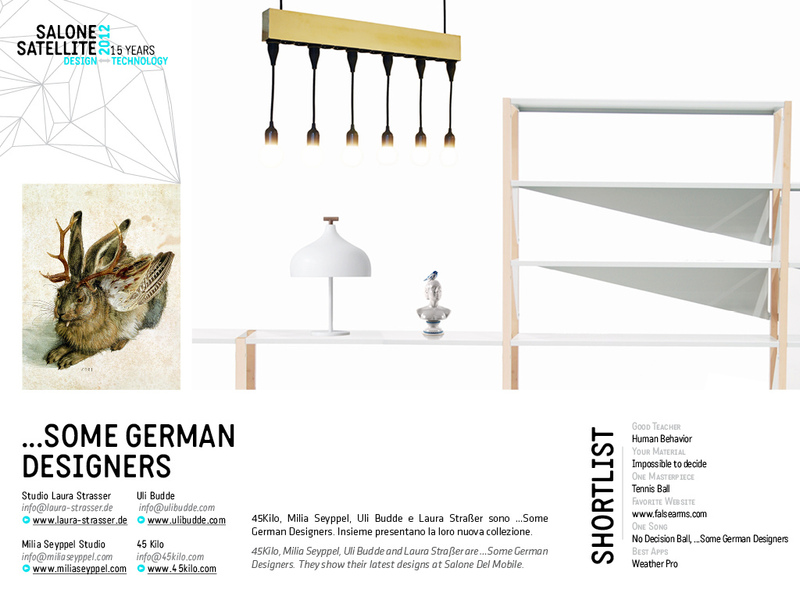 The Salone Satellite is a unique showcase, where a number of designers who are by now world-famous made their debut: Matali Crasset, Patrick Jouin, Paolo Ulian, Satyendra Pakhalé, Tomoko Azumi, Lorenzo Damiani, Ilkka Suppanen, Nendo, Adriano Design, Harri Koskinen, Xavier Lust, Front, to name but a few. Avverati, the Italian word for something that has come true, such as a dream. 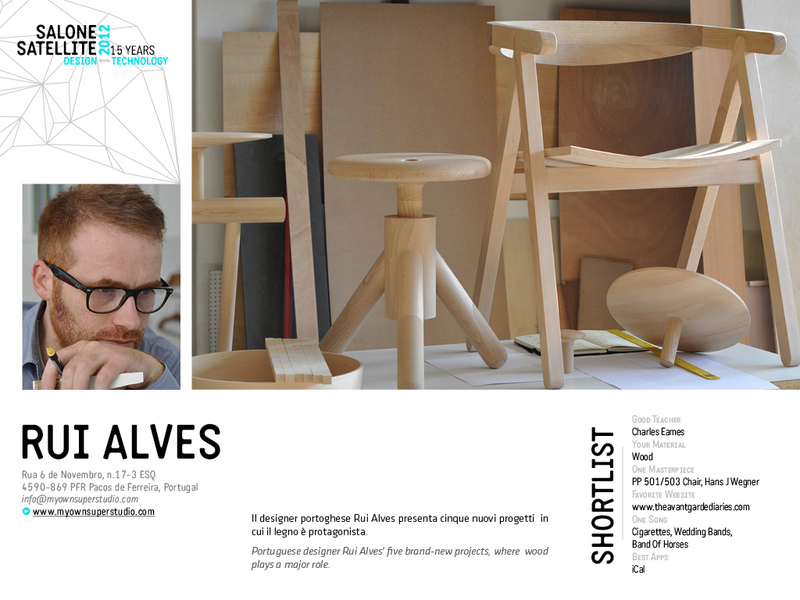 Avvèrati – with the stress on the second syllable – turns it into an invitation to make oneself come true, to realise one’s own dreams and creative potential. 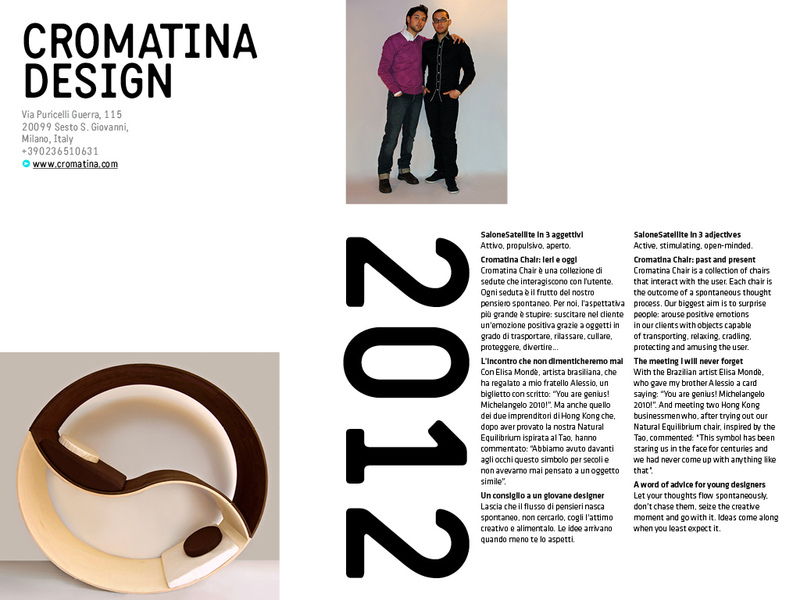 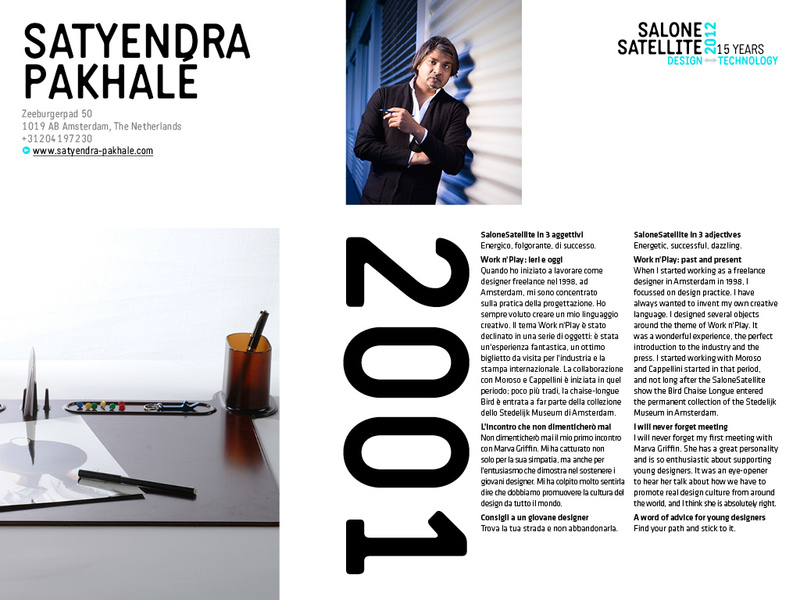 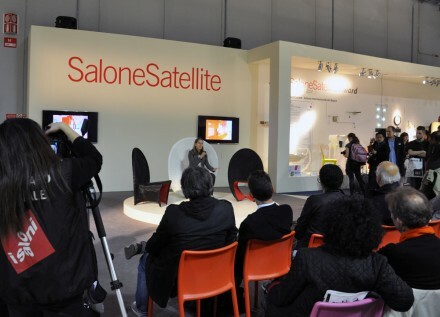 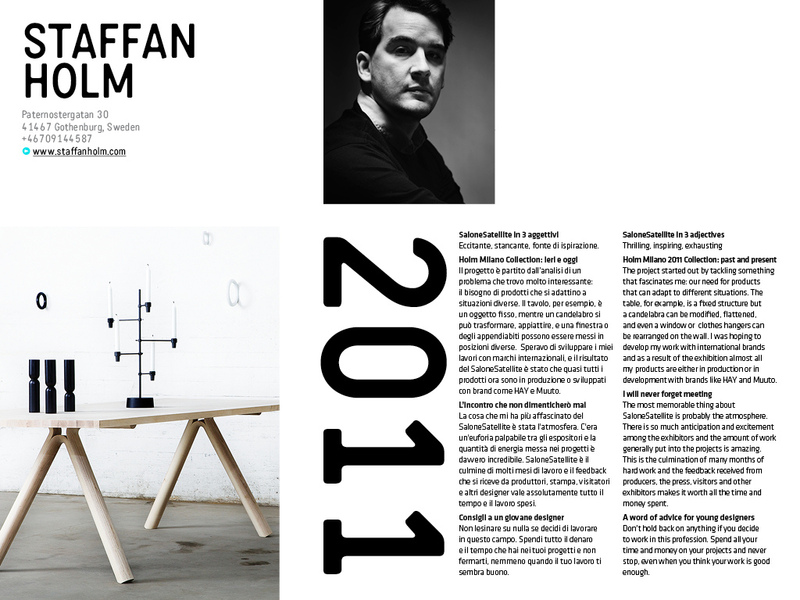 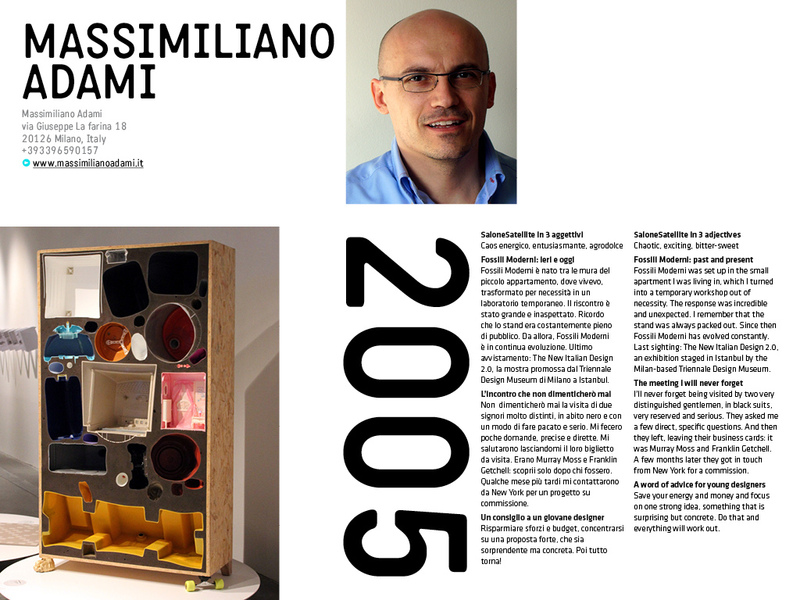 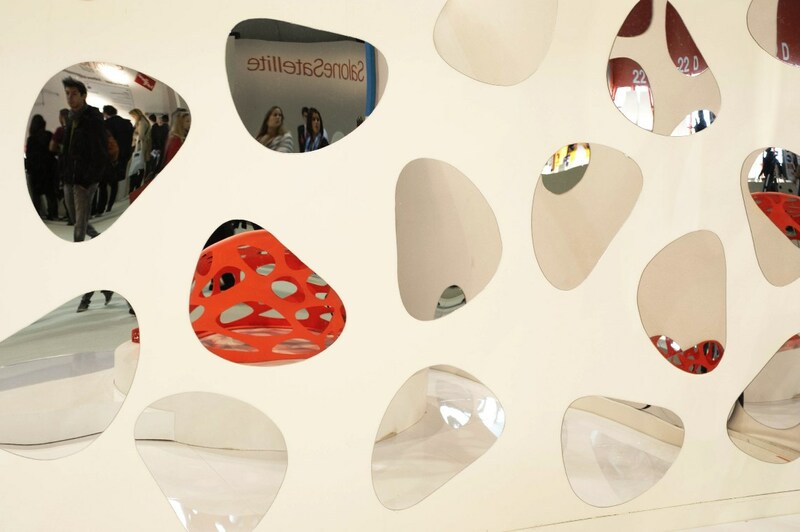 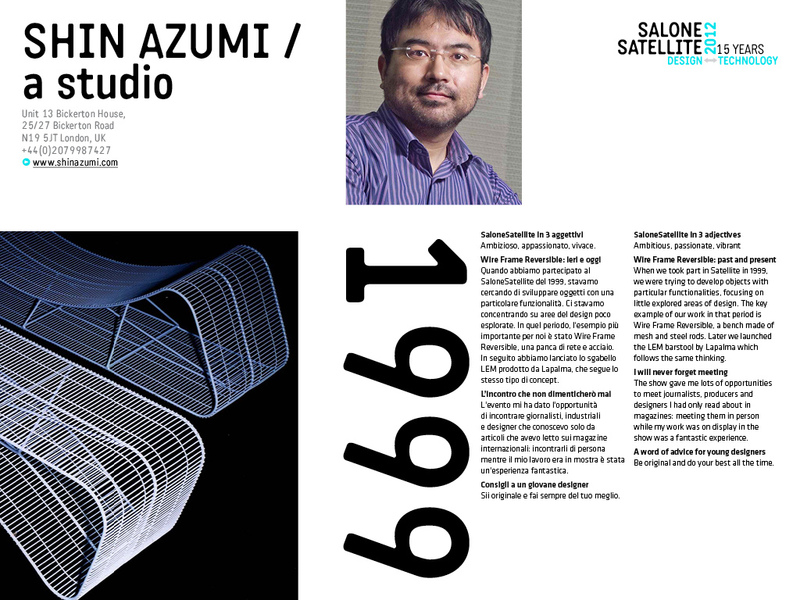 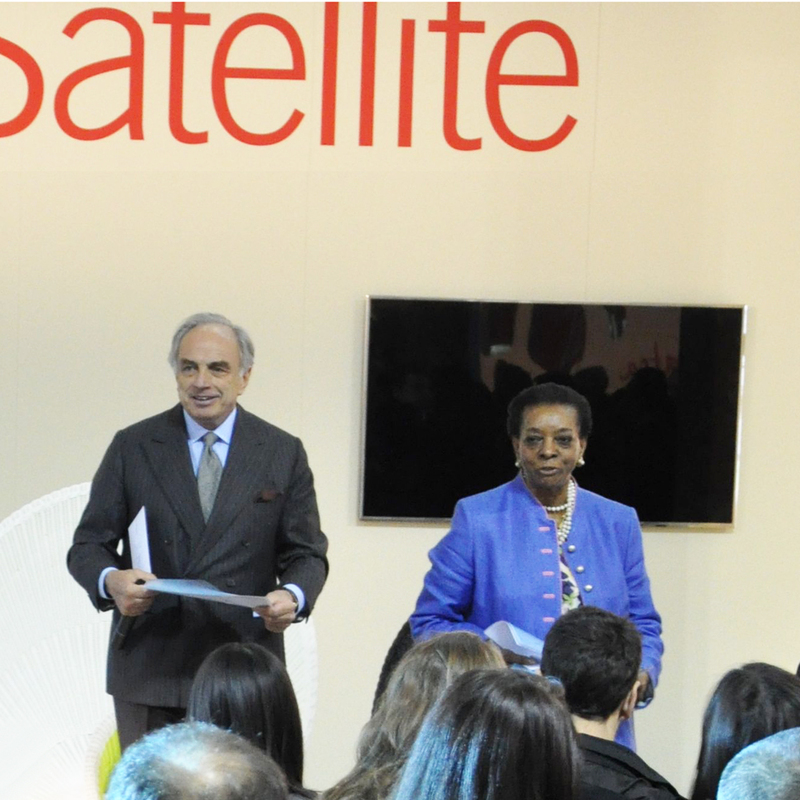 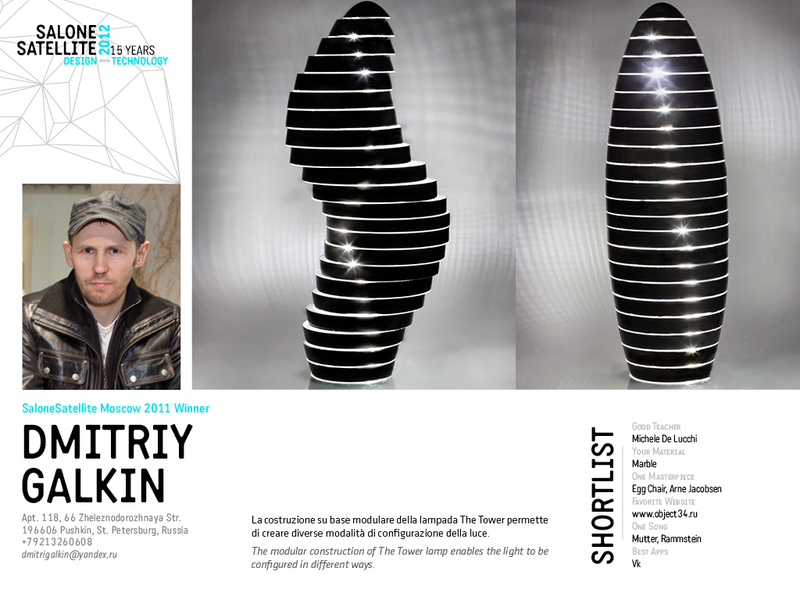 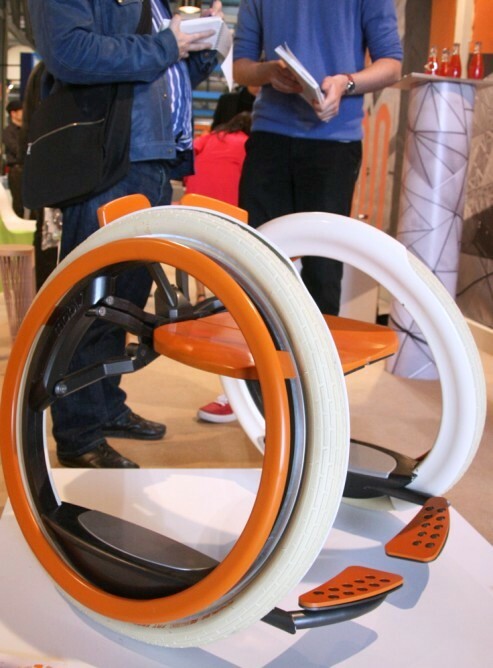 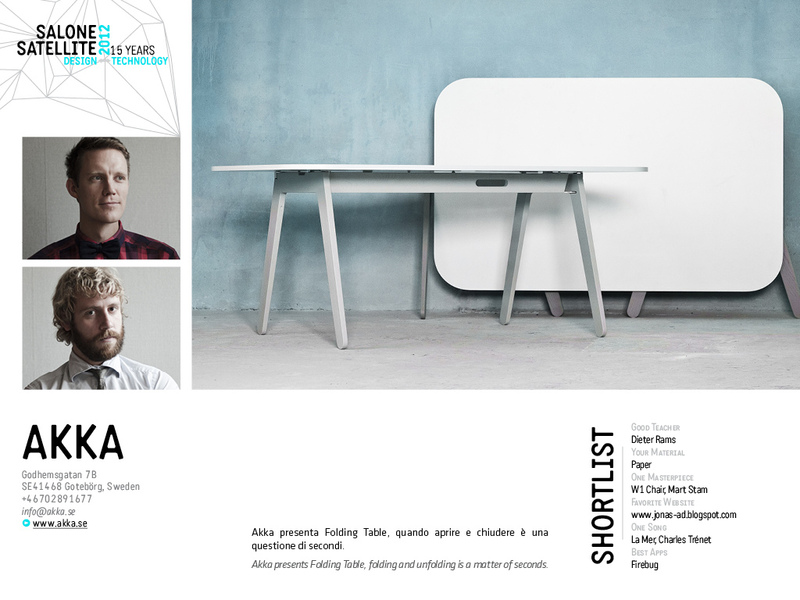 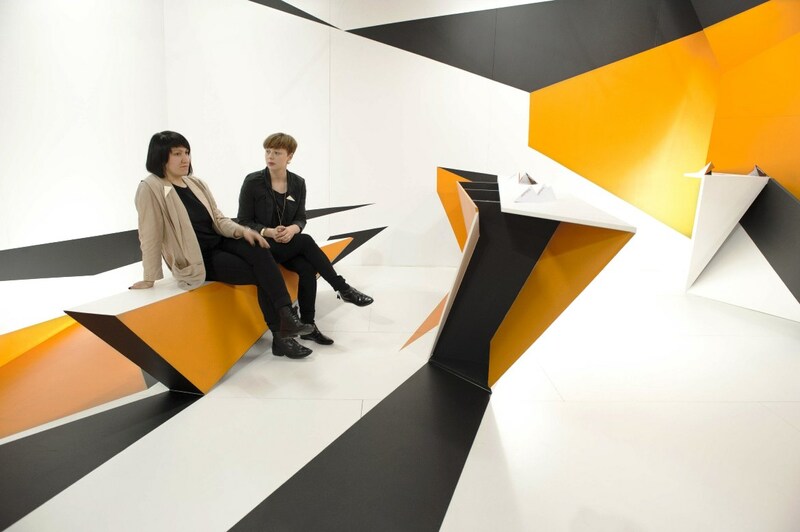 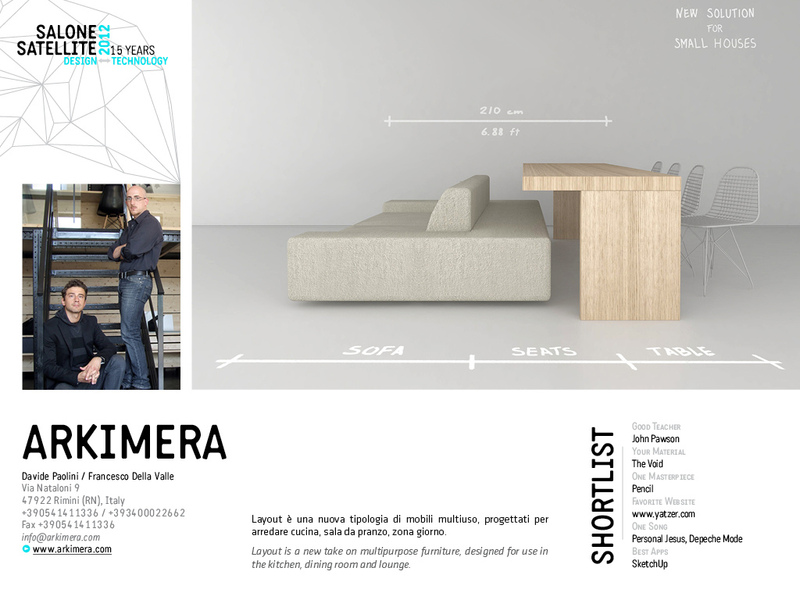 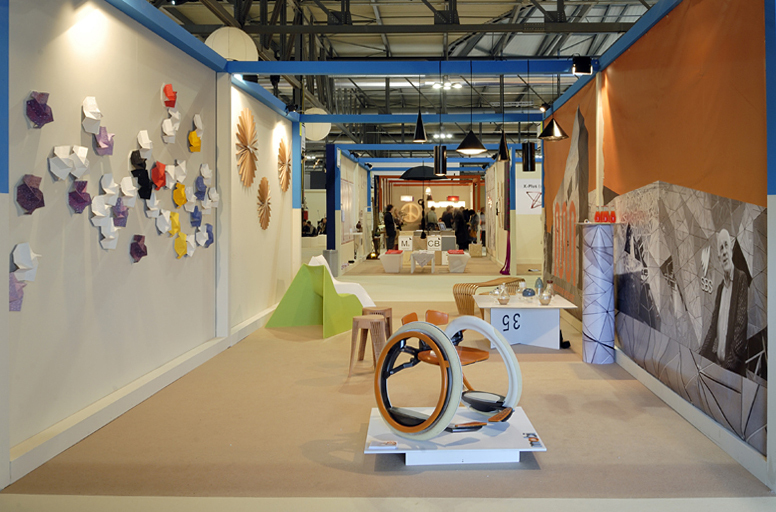 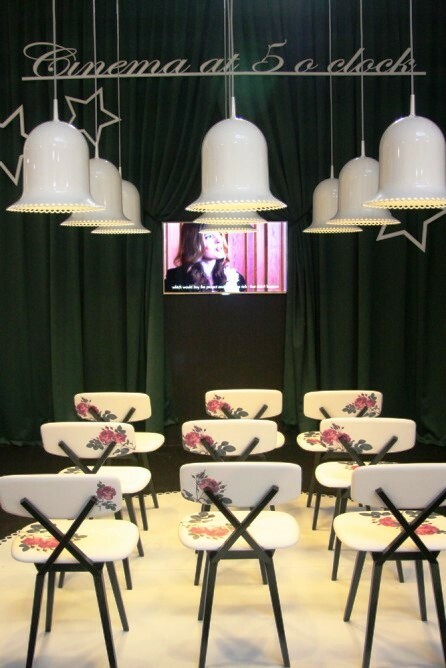 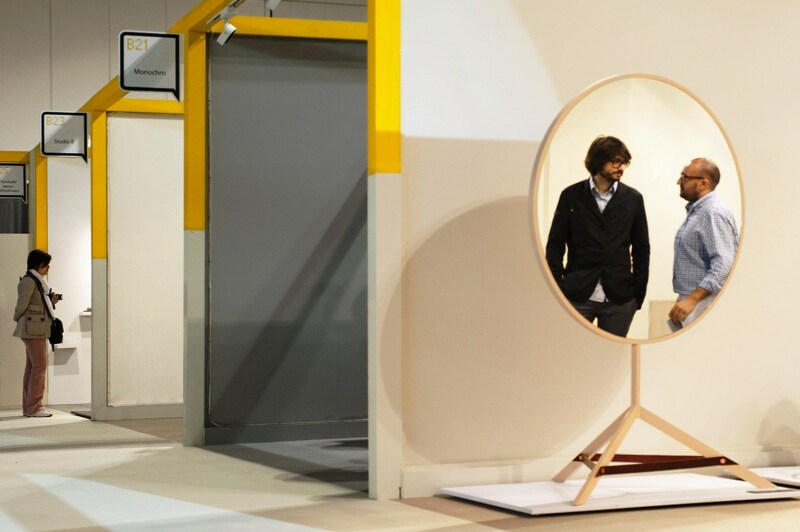 Which is exactly what Cosmit and the Salone Satellite are dedicated to helping young designers do. 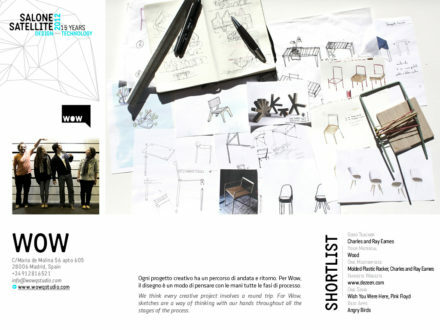 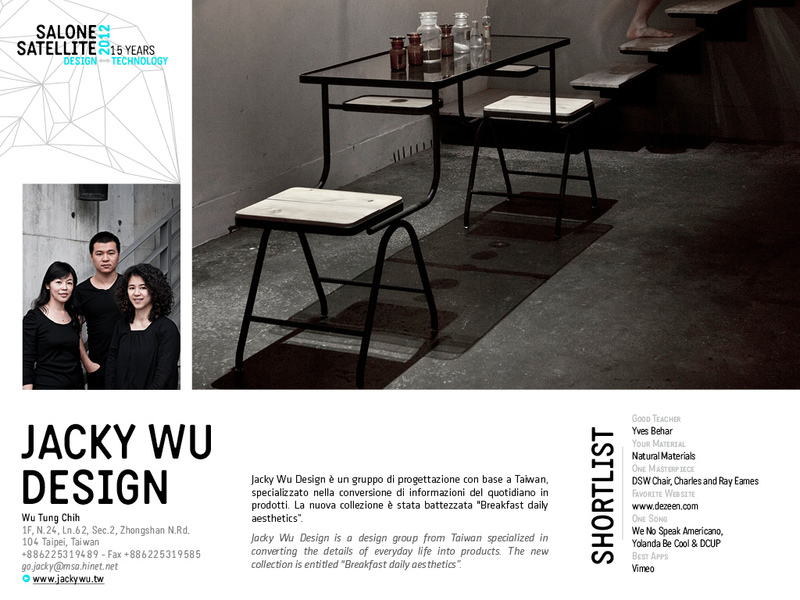 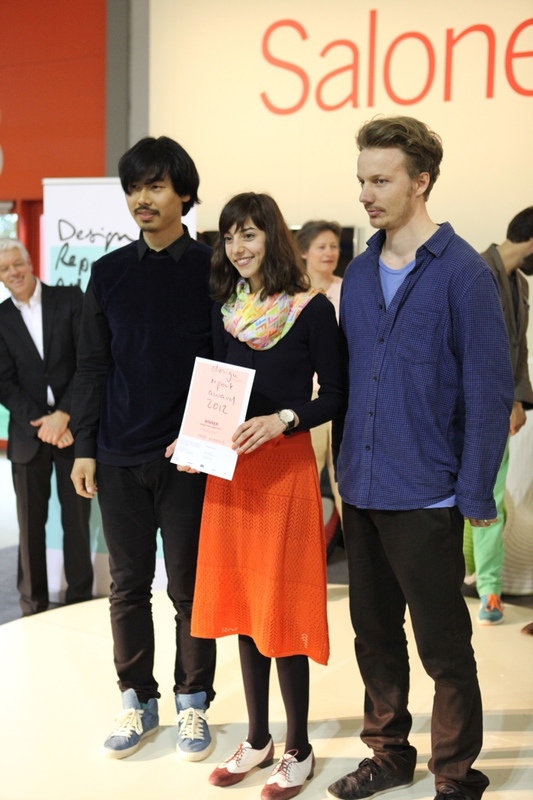 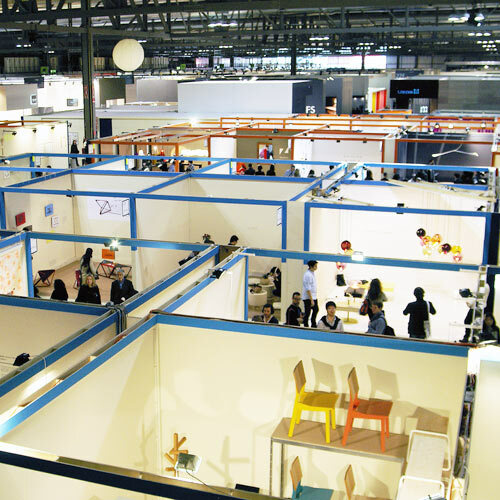 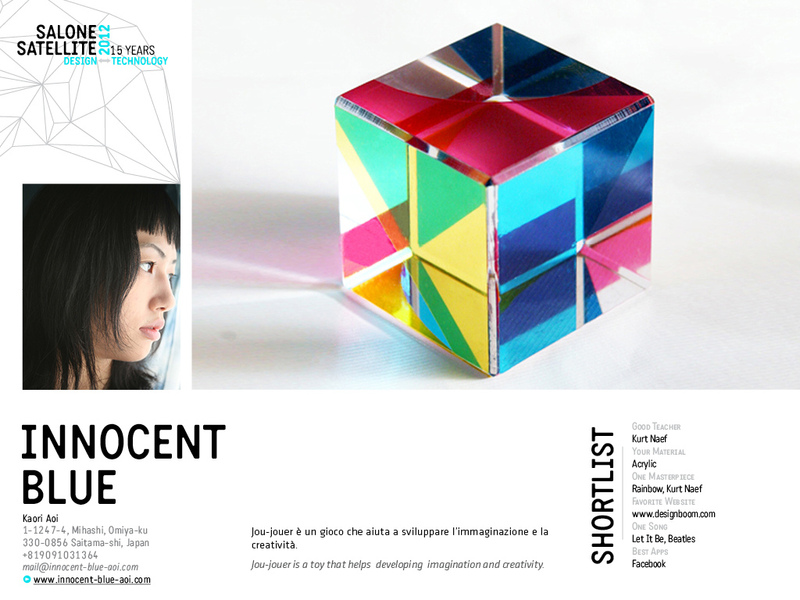 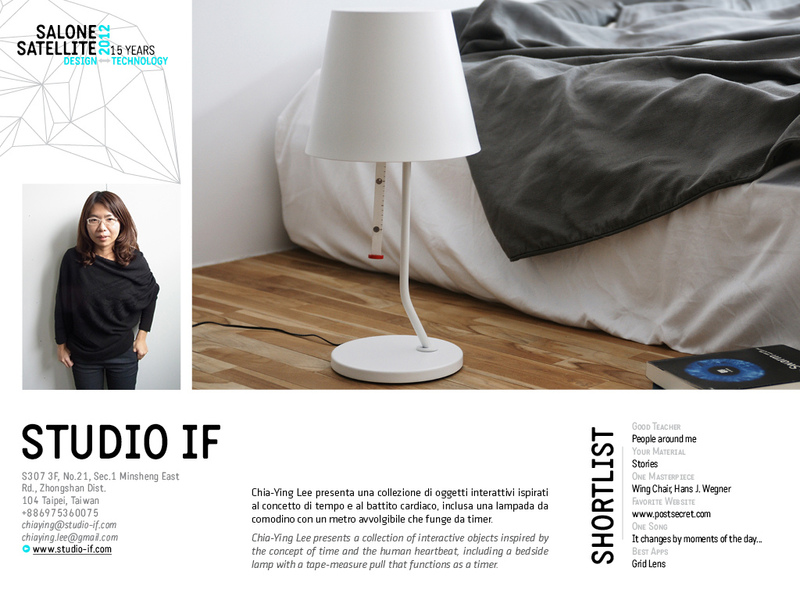 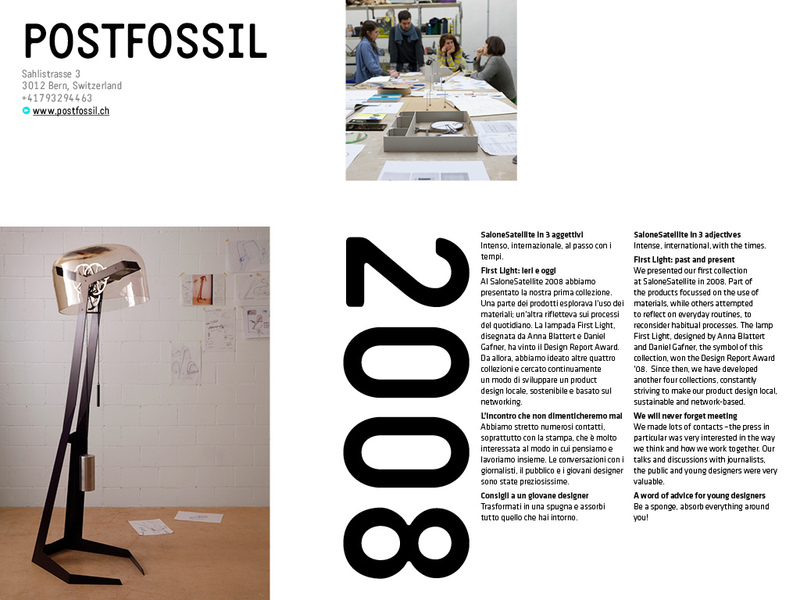 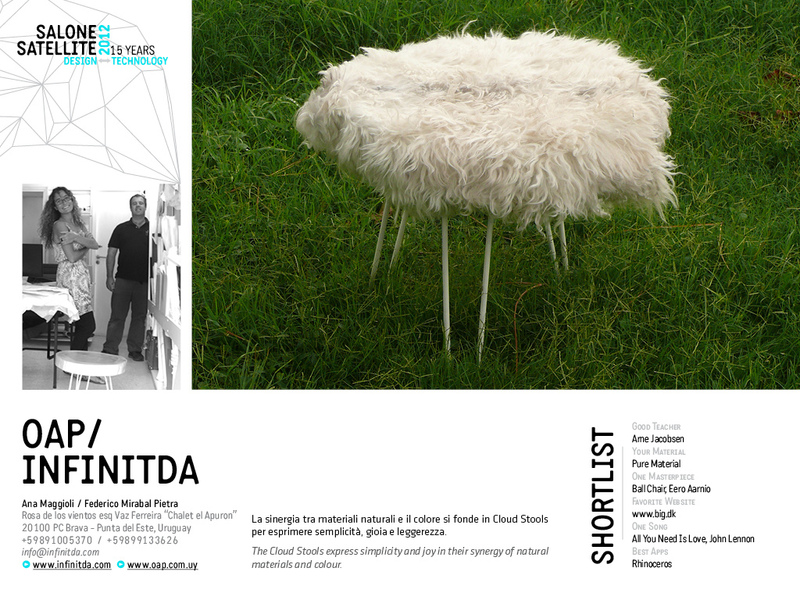 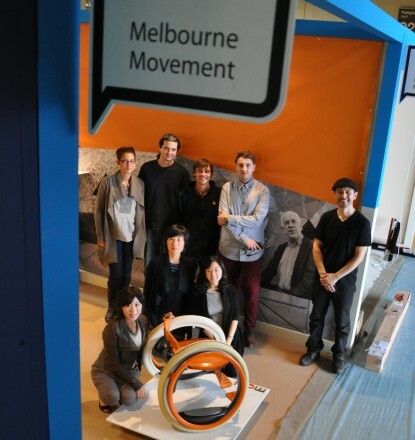 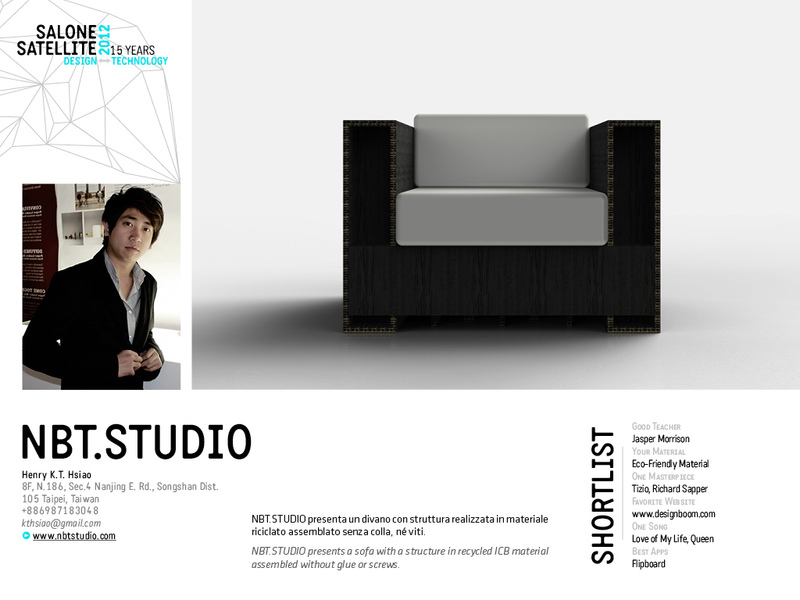 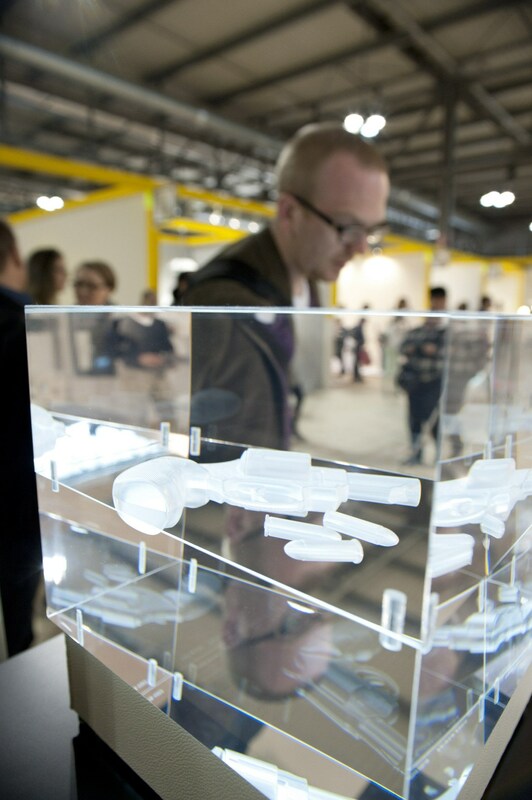 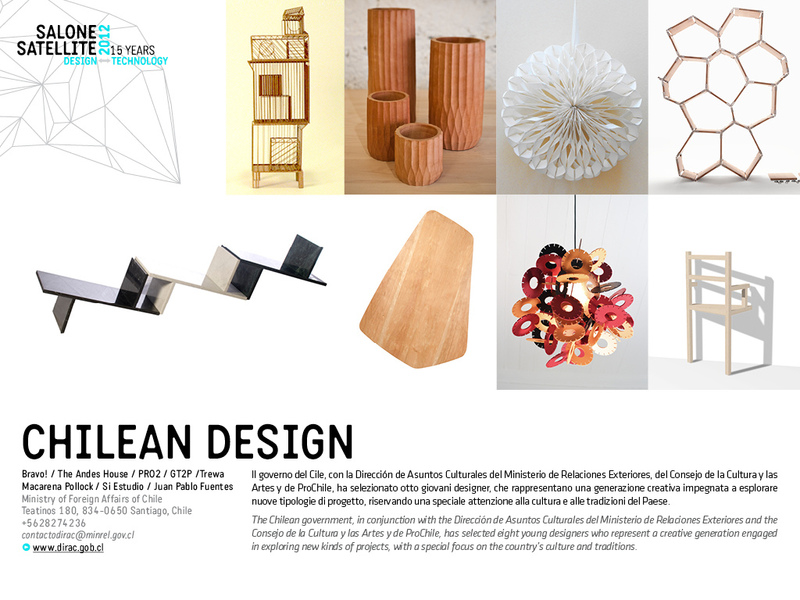 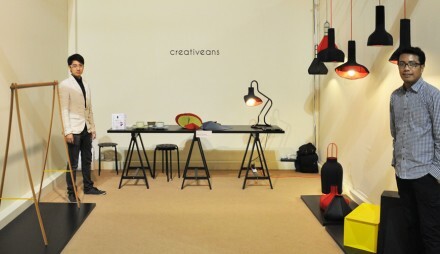 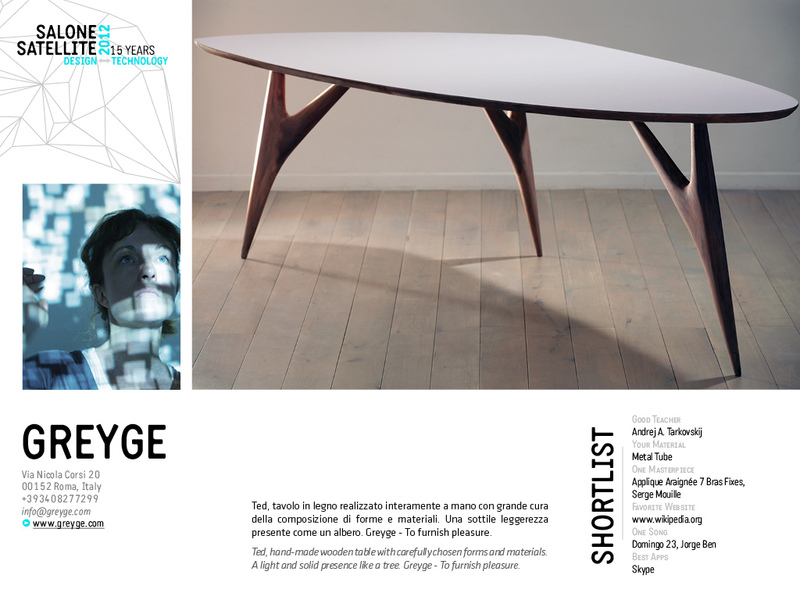 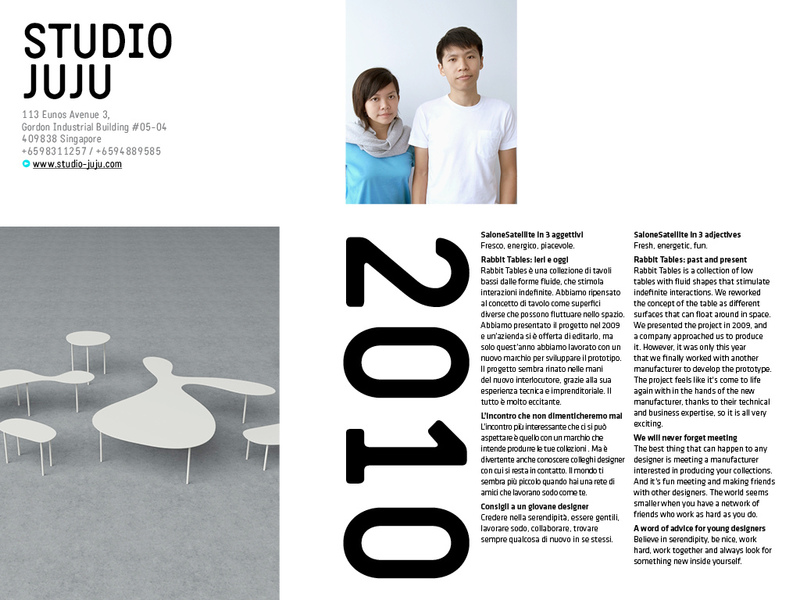 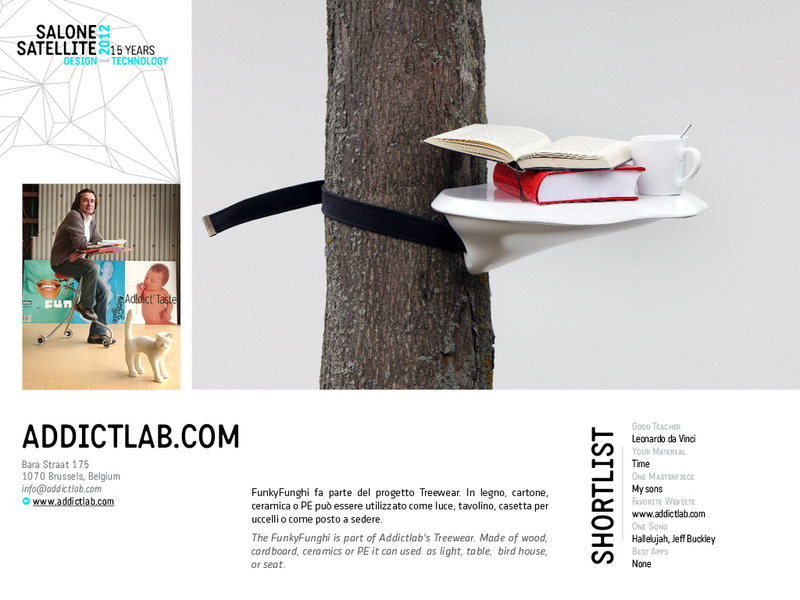 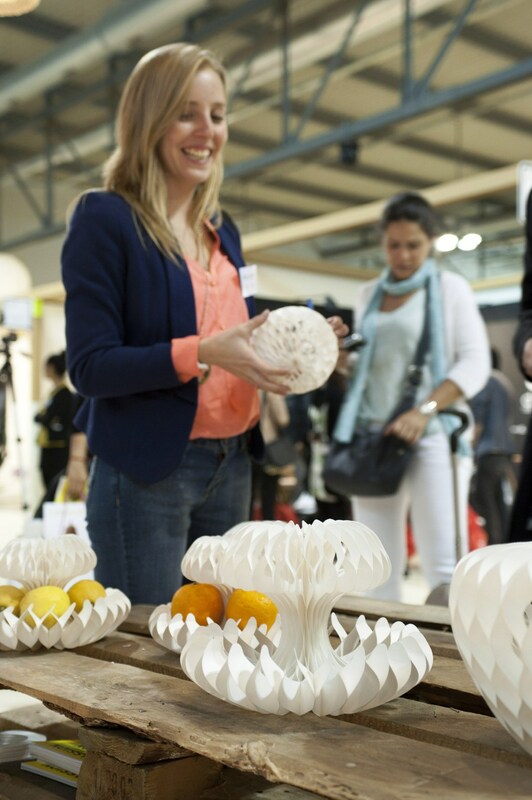 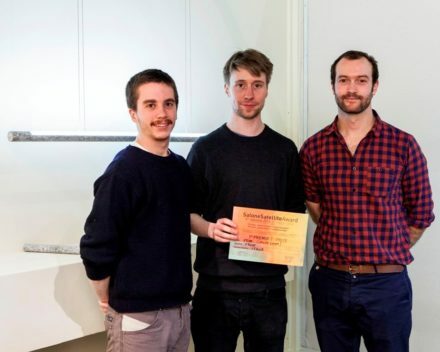 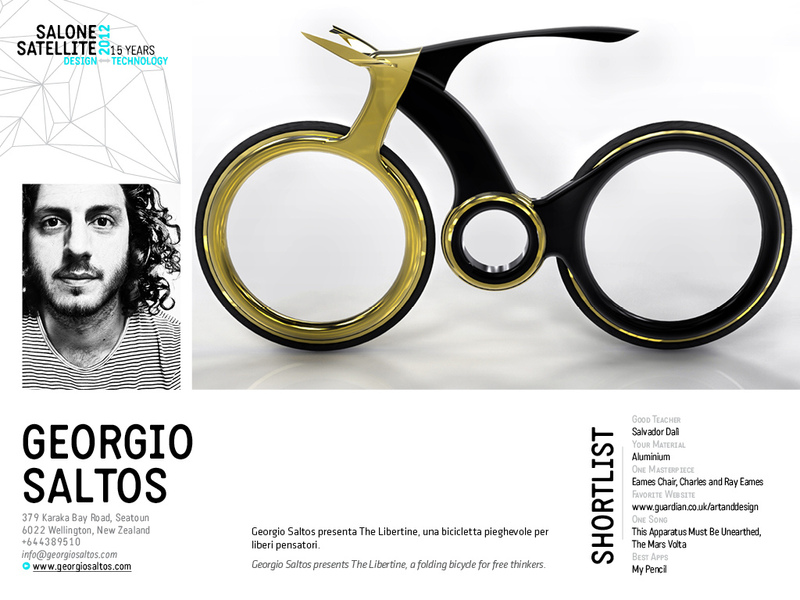 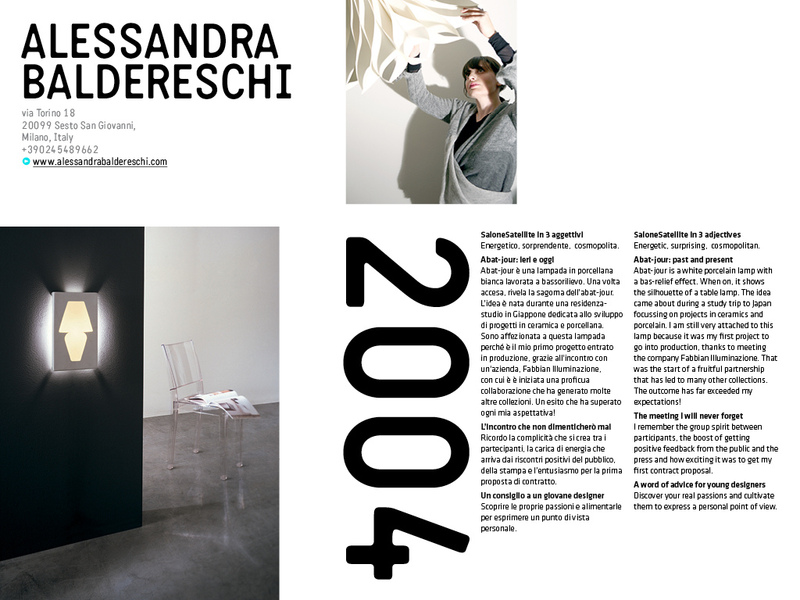 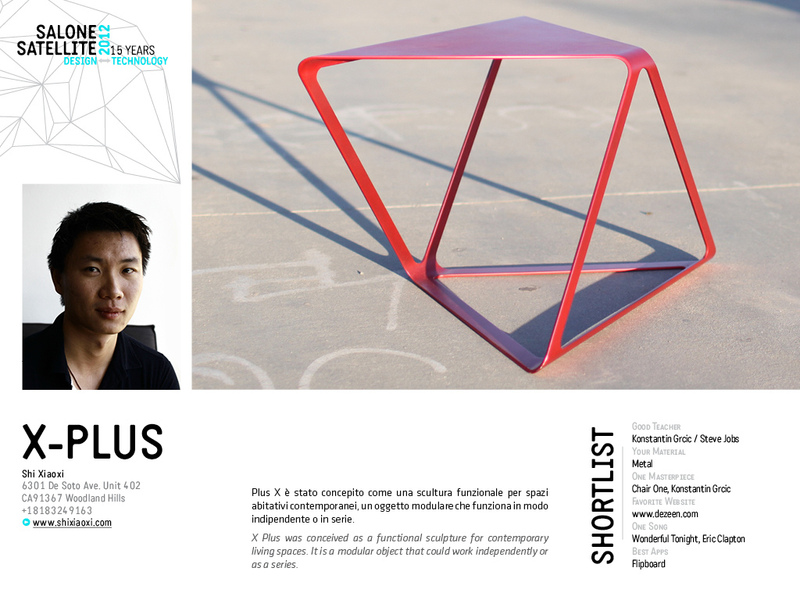 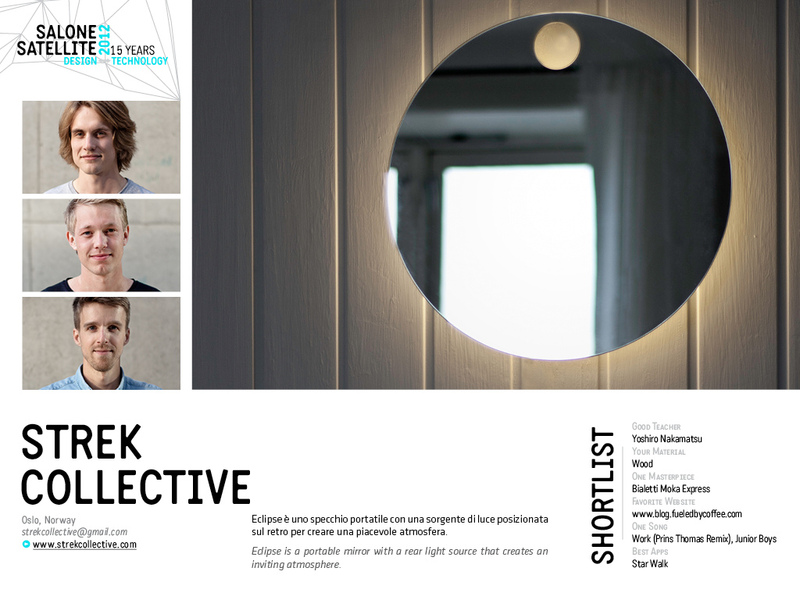 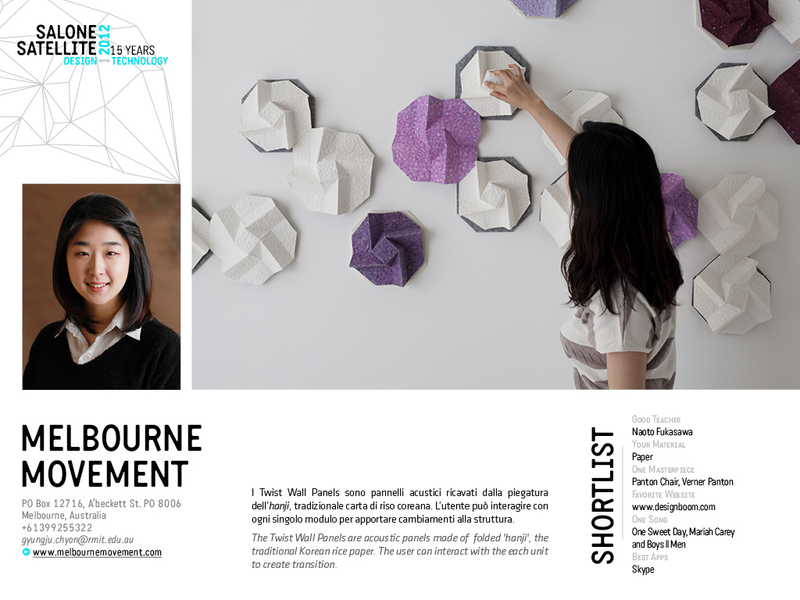 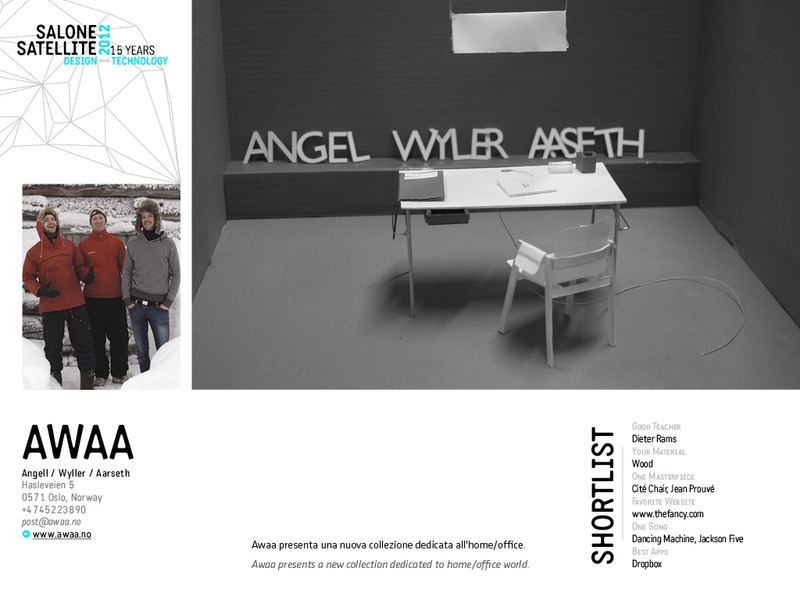 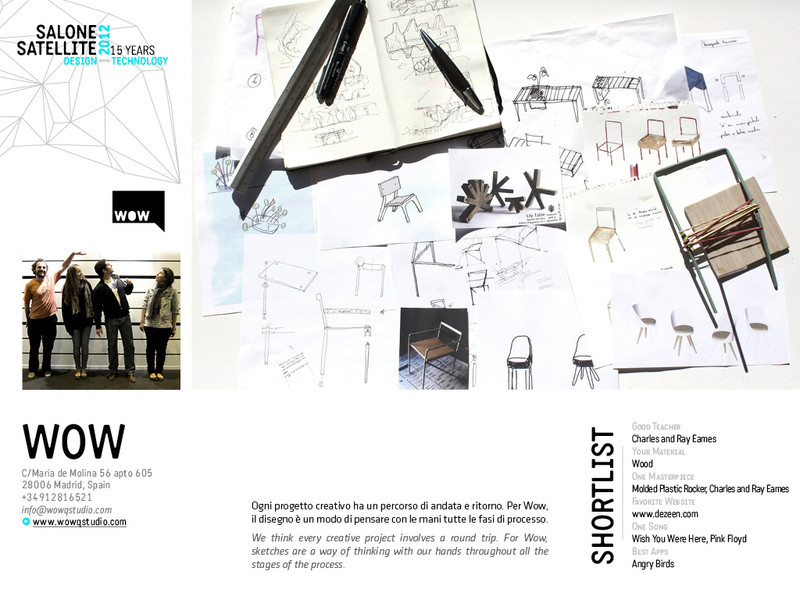 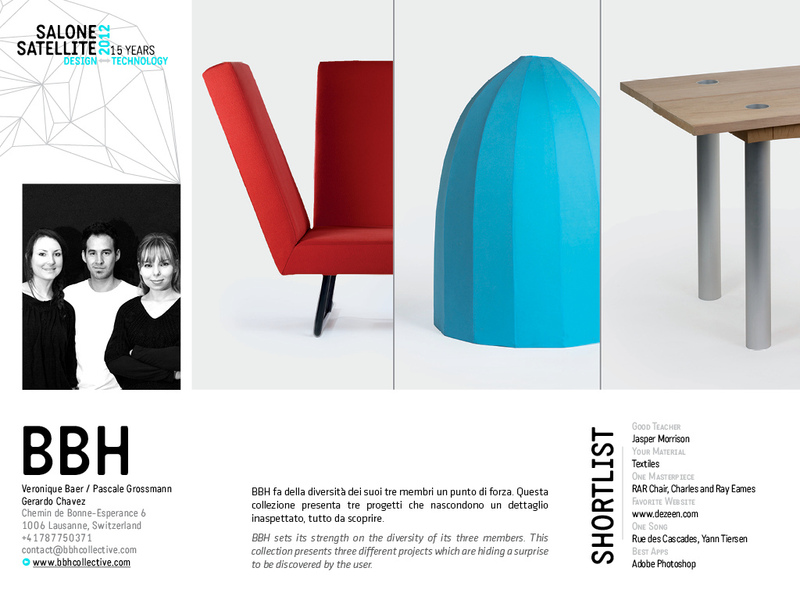 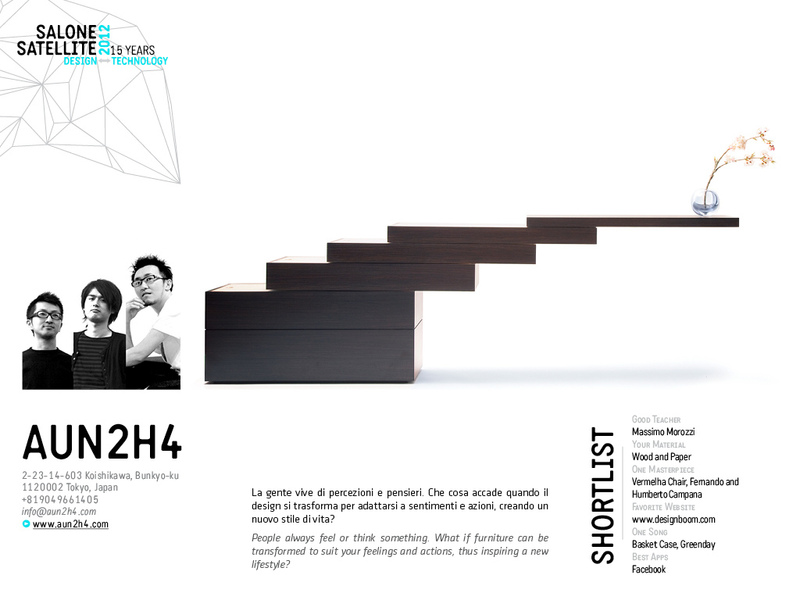 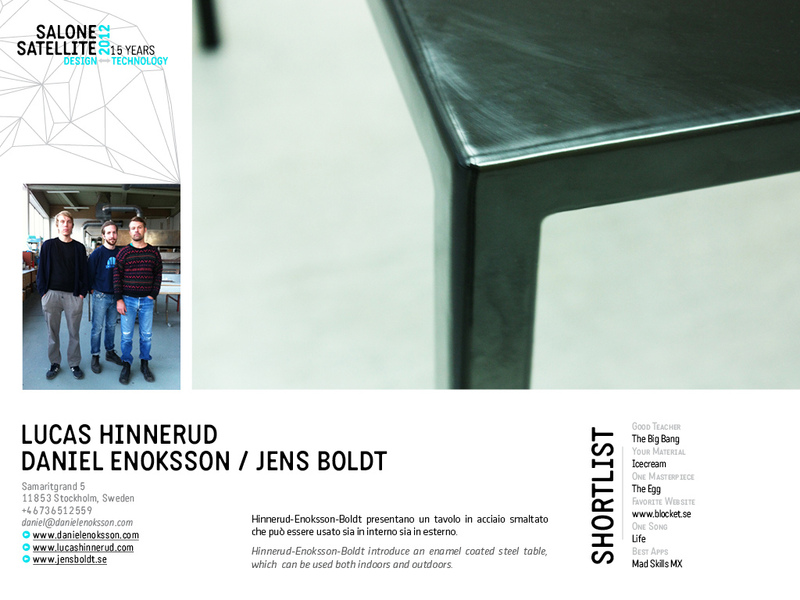 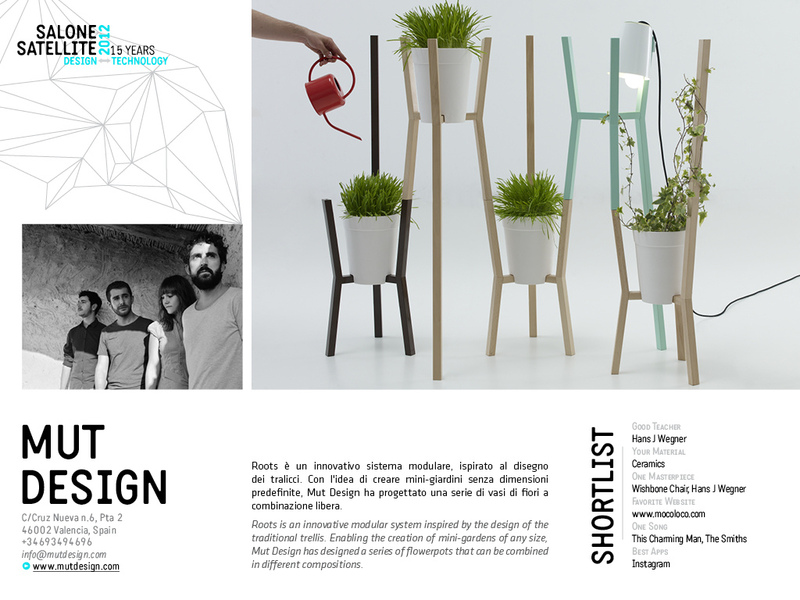 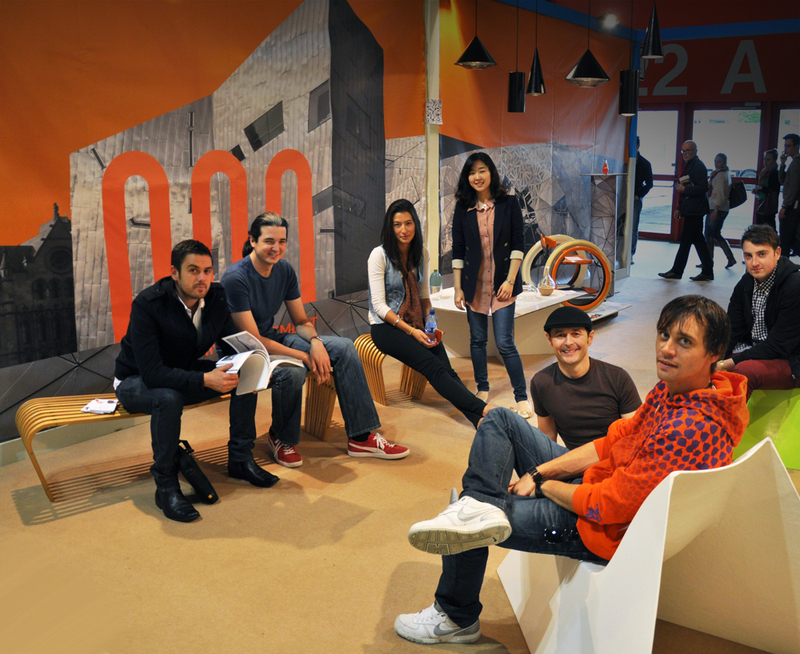 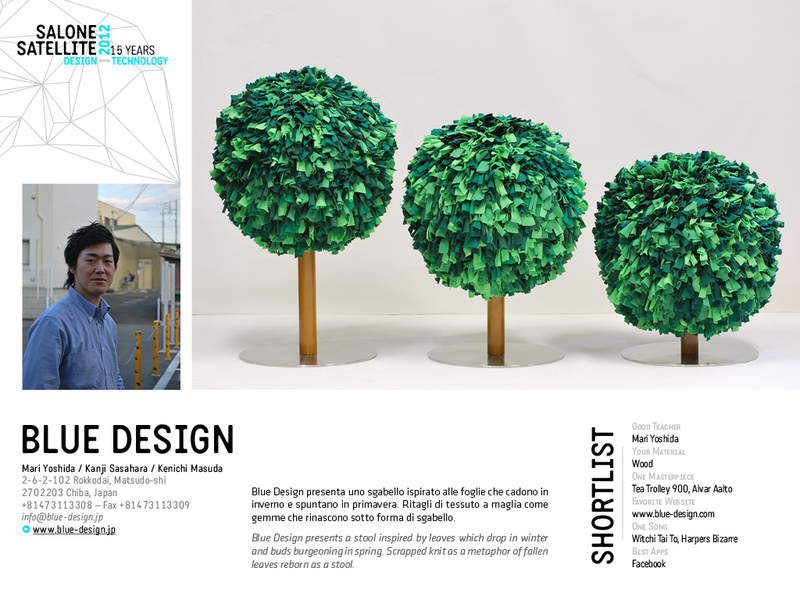 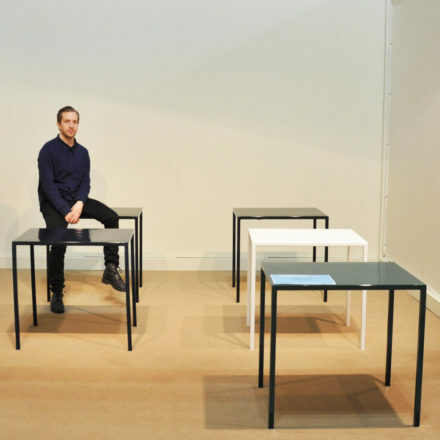 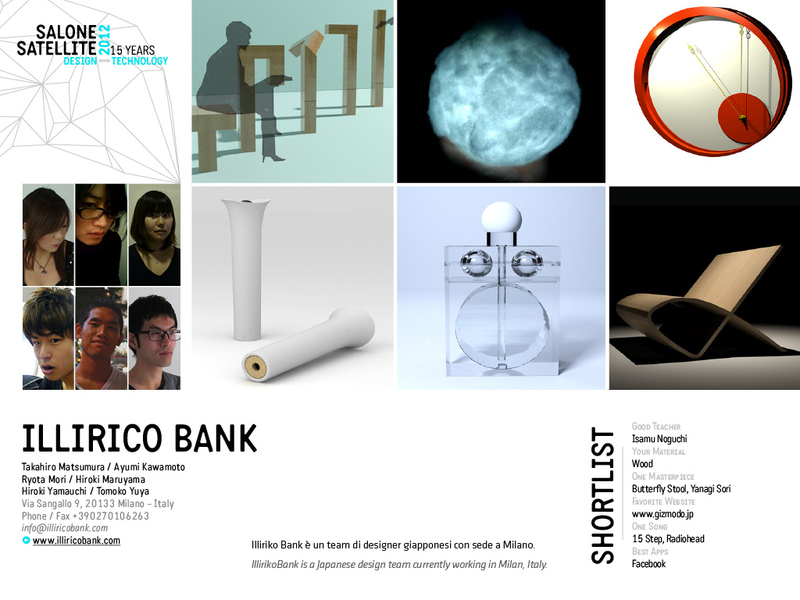 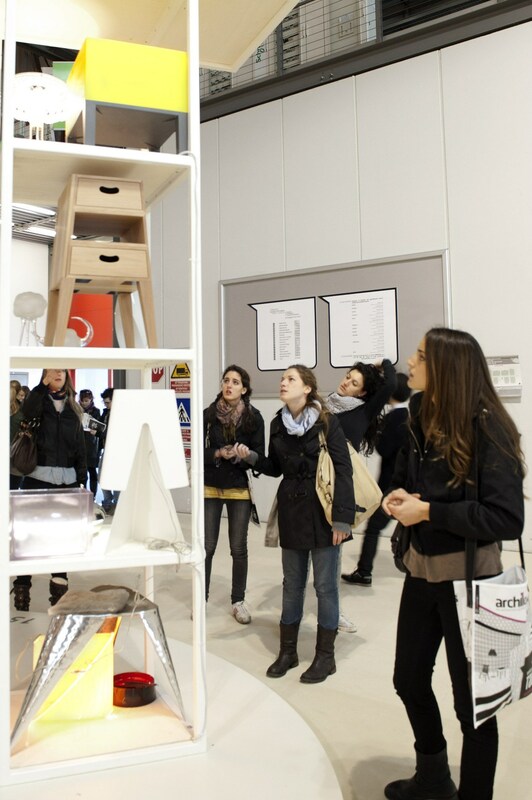 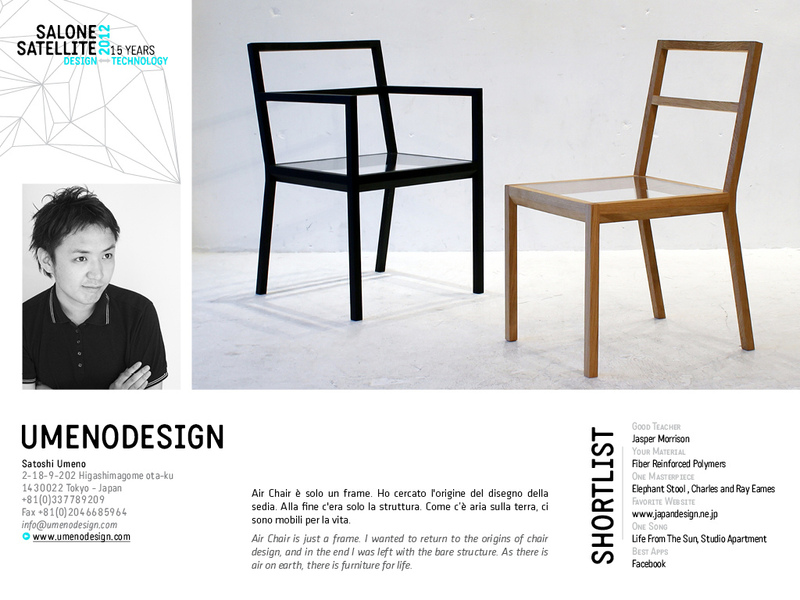 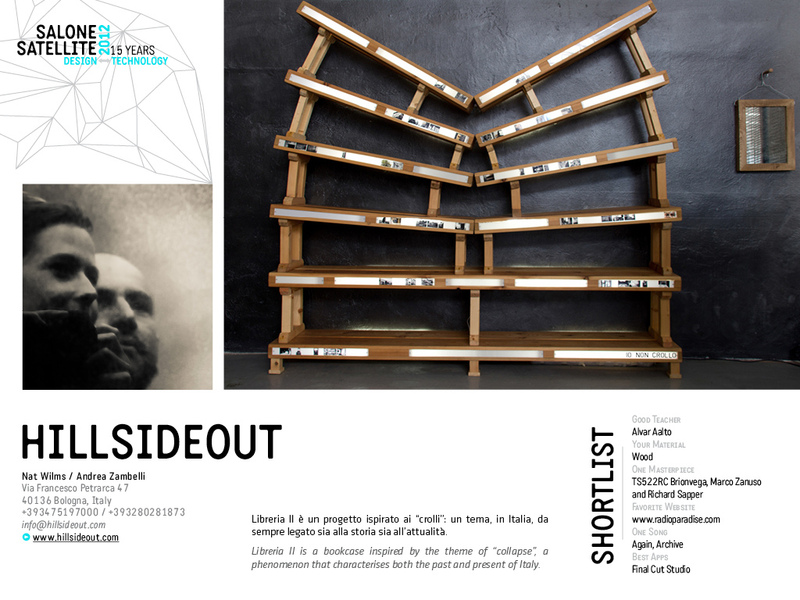 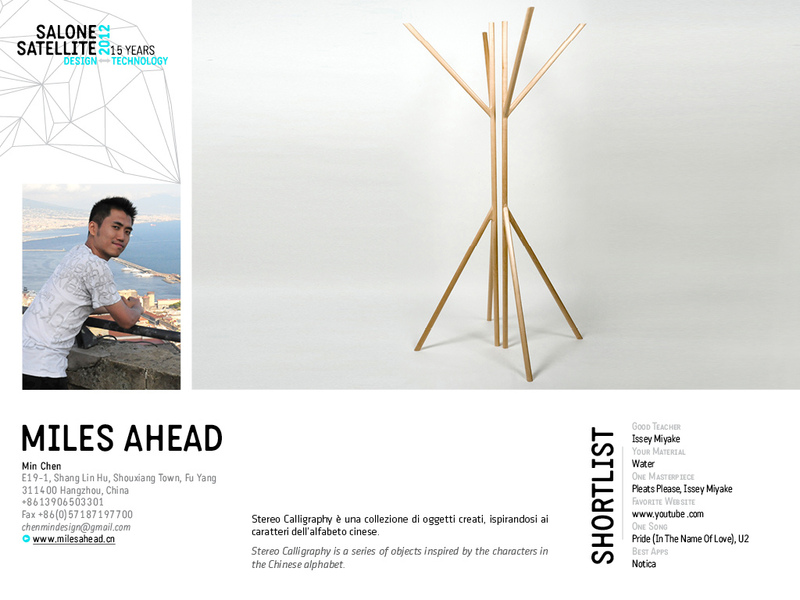 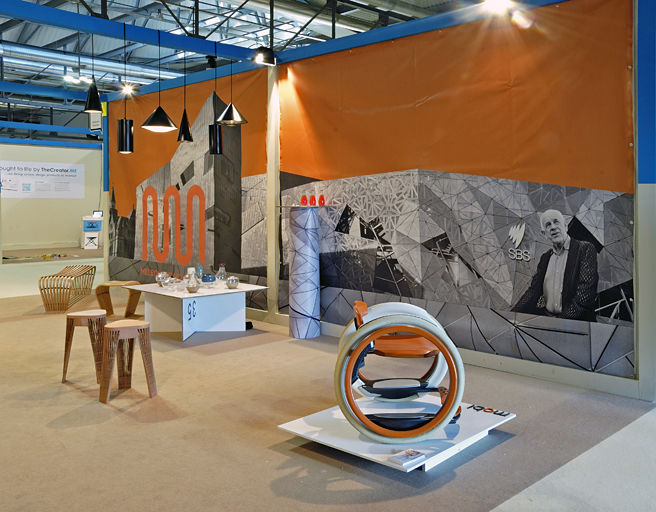 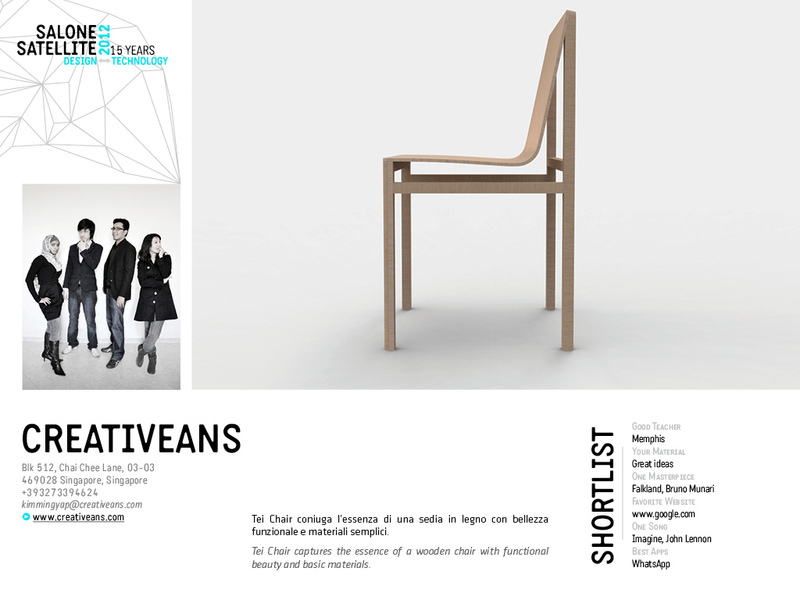 Alongside the selected few were 17 design schools ( incl RMIT – Melbourne Design Movement), of which the following participated for the first time at the Salone Satellite: American University of Sharjah, United Arab Emirates; Art Future design School, Russia; Centro de Investigaciones de Diseño Industrial, Mexico; Central Academy of Fine Arts, China; Enaip-CSF, Italy; Hanseo University, Korea; Istituto Europeo di Design, Spain; Kanazawa College of Art, Japan; New York Institute of Technology, USA; Politecnico di Milano, Italy; PUC-Pontificia Universidade do Rio de Janeiro, Brazil; Ss. 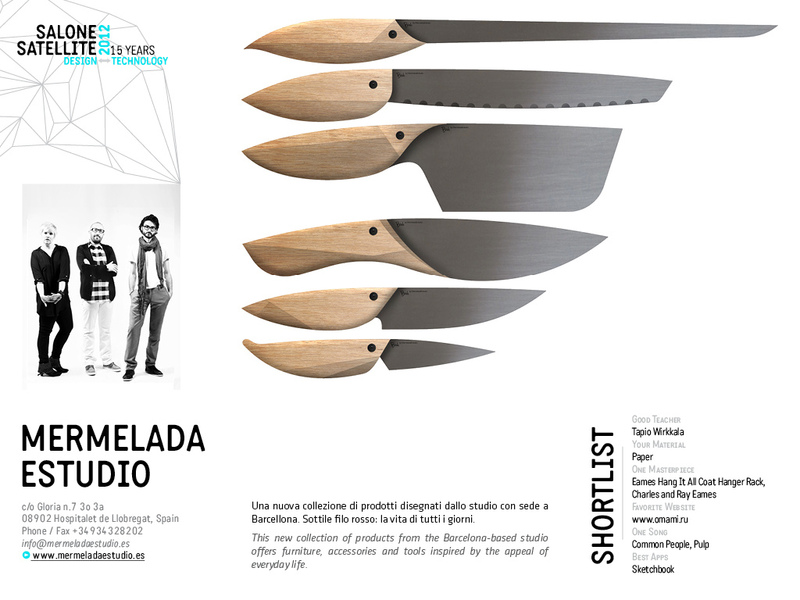 Cyril and Methodius University, Macedonia; Technical School Wood Art, Serbia; Universidad Piloto de Colombia, Colombia; Hochschule Darmstadt, Germany; University of Cambridge, Great Britain. 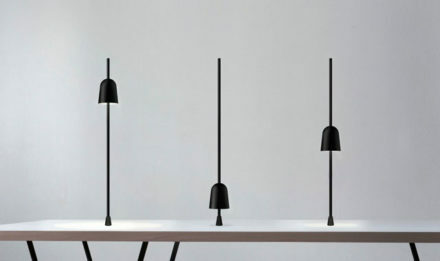 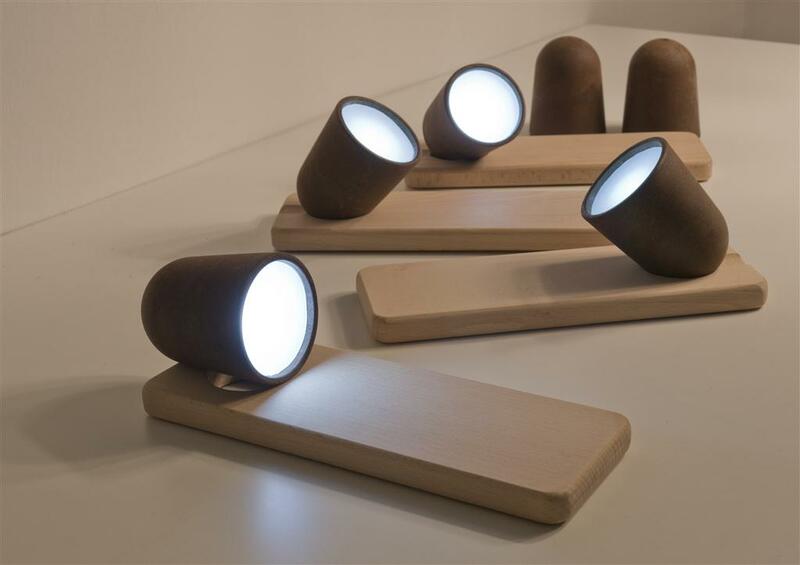 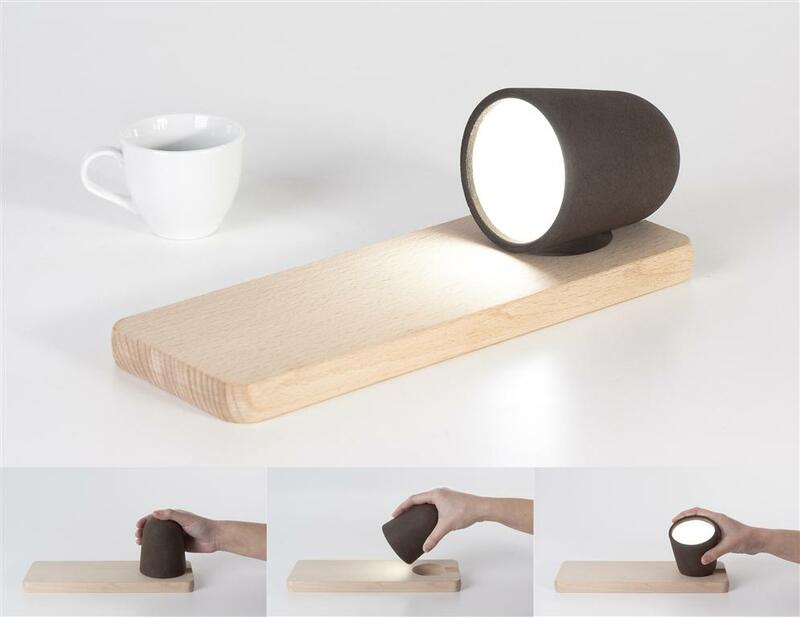 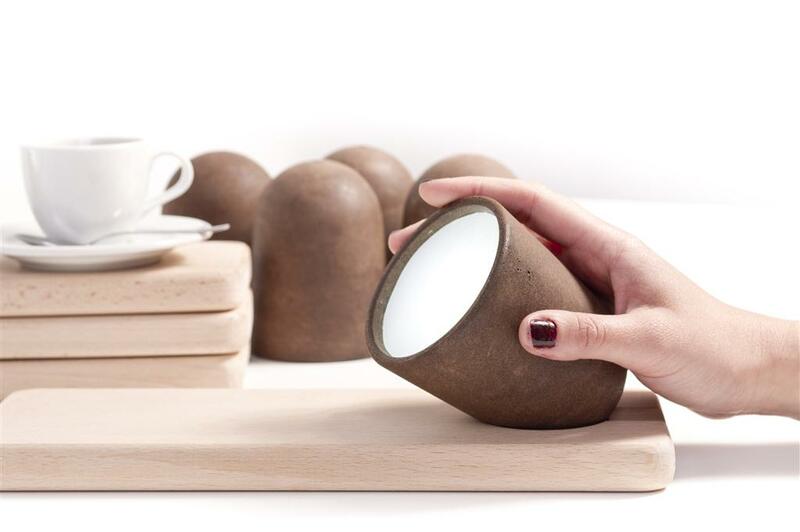 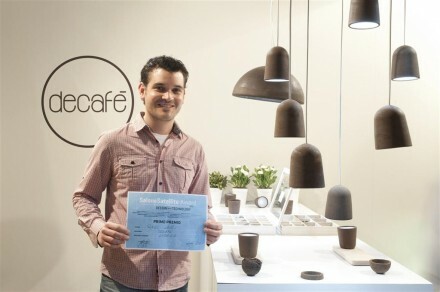 Decafe Lamp – made with biodegradable material derived from coffee grounds. 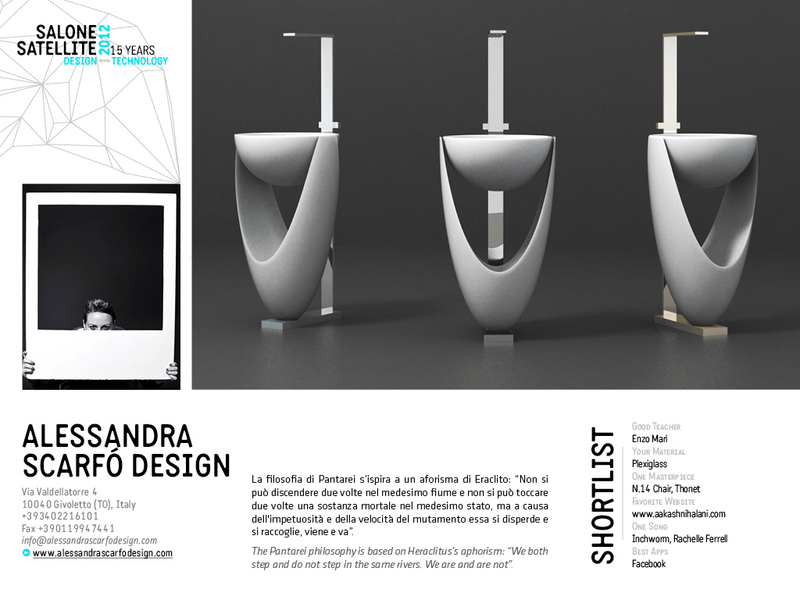 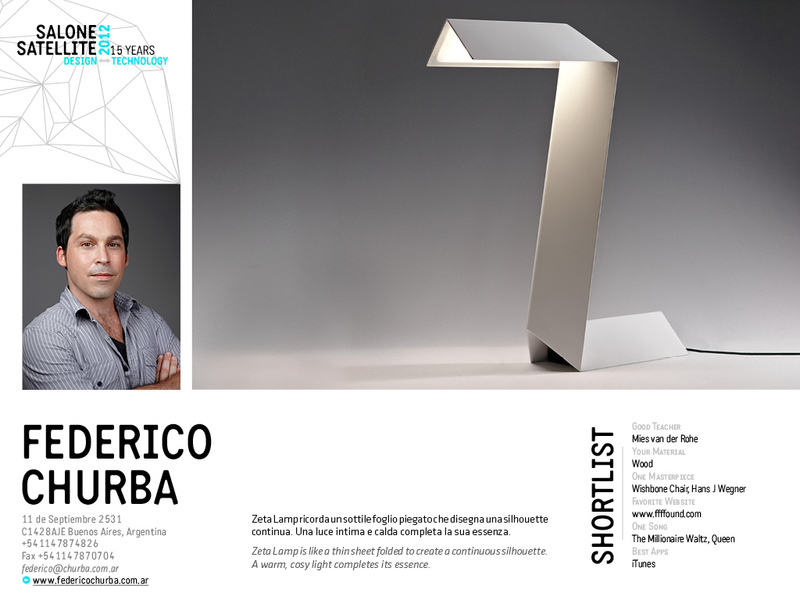 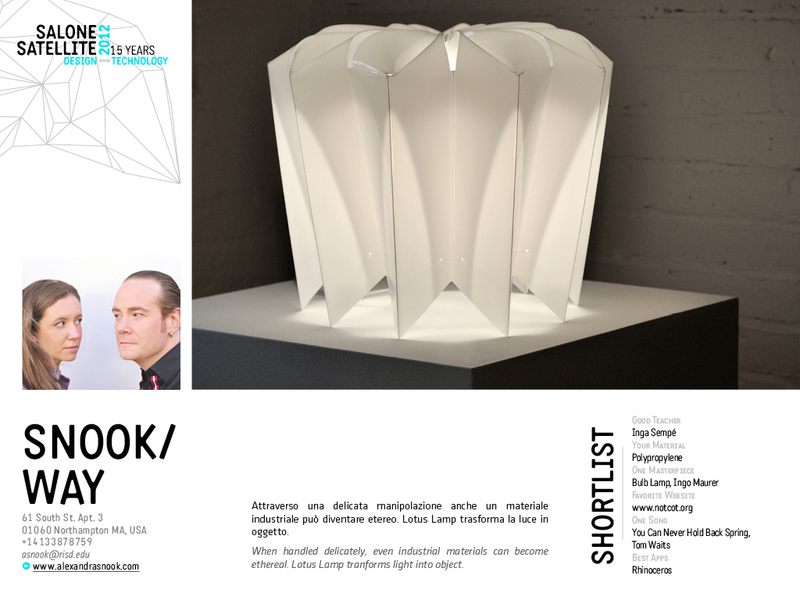 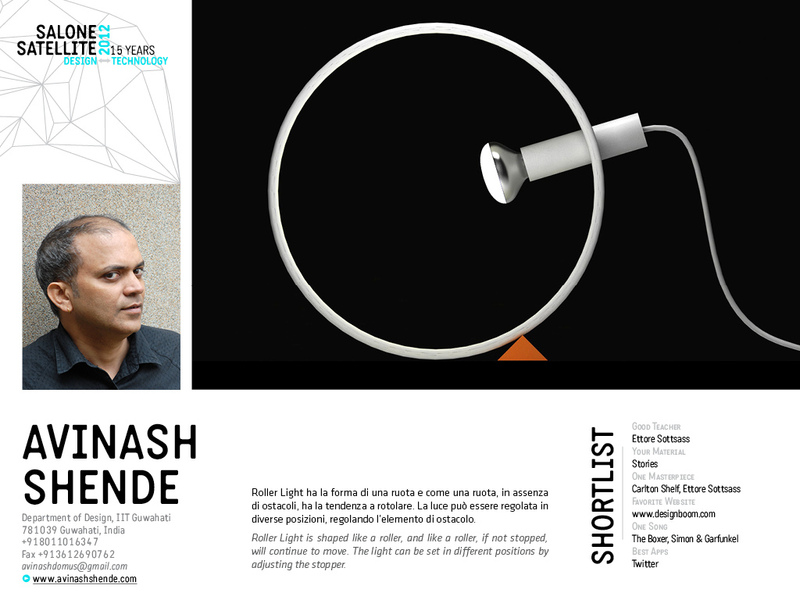 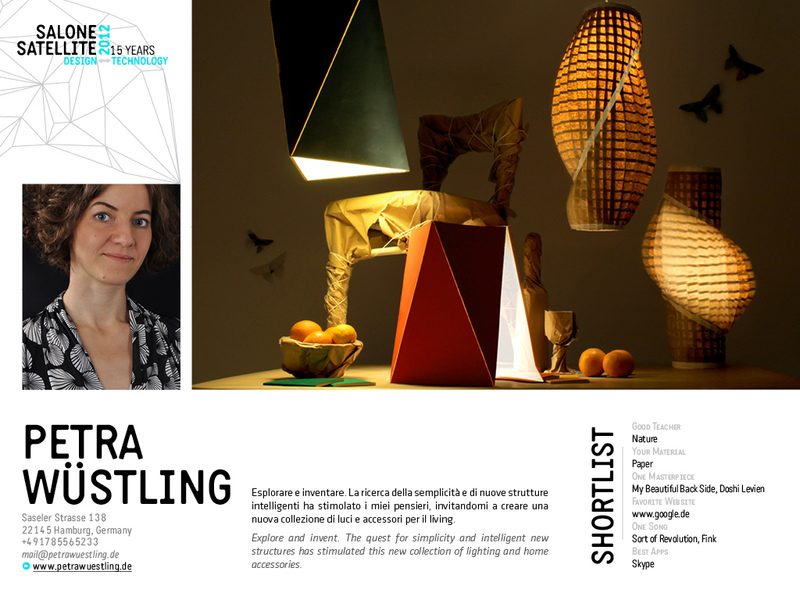 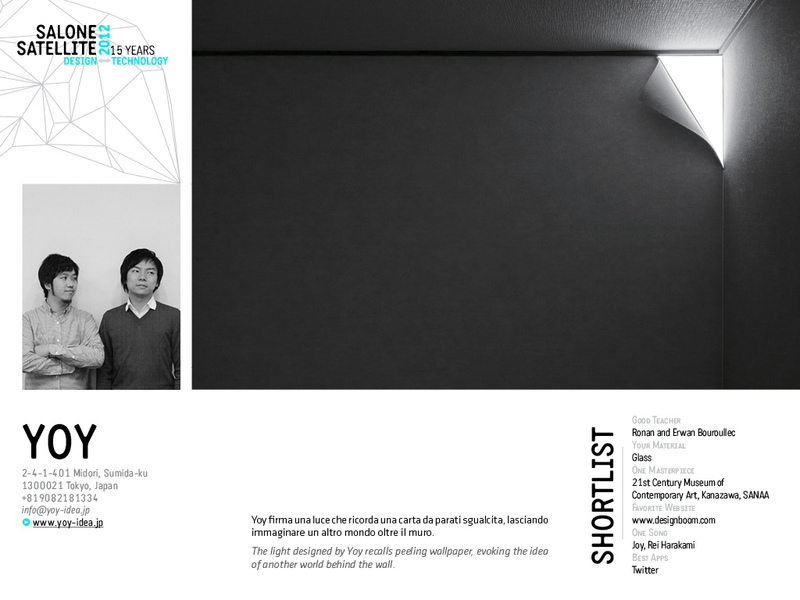 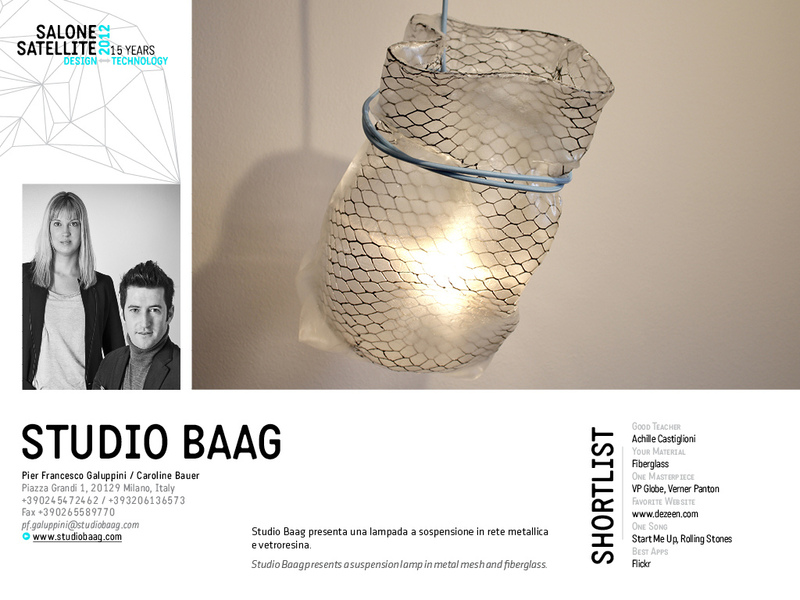 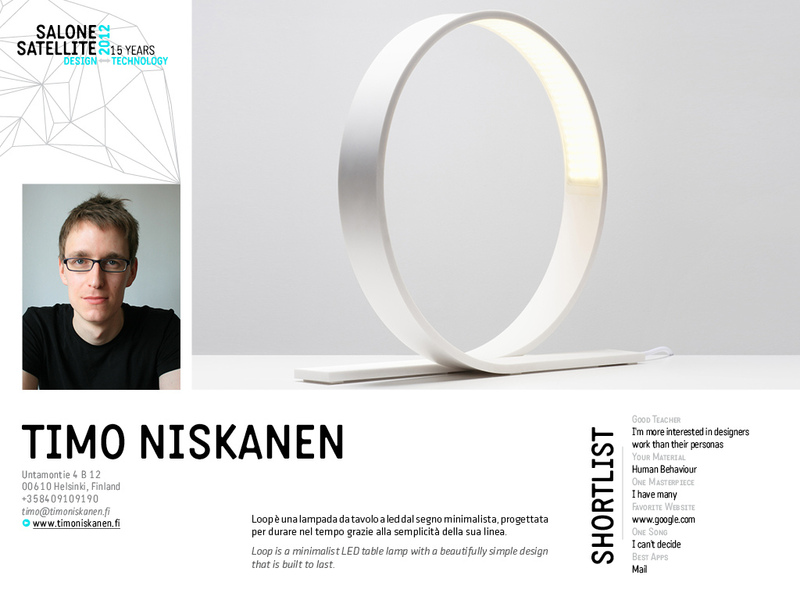 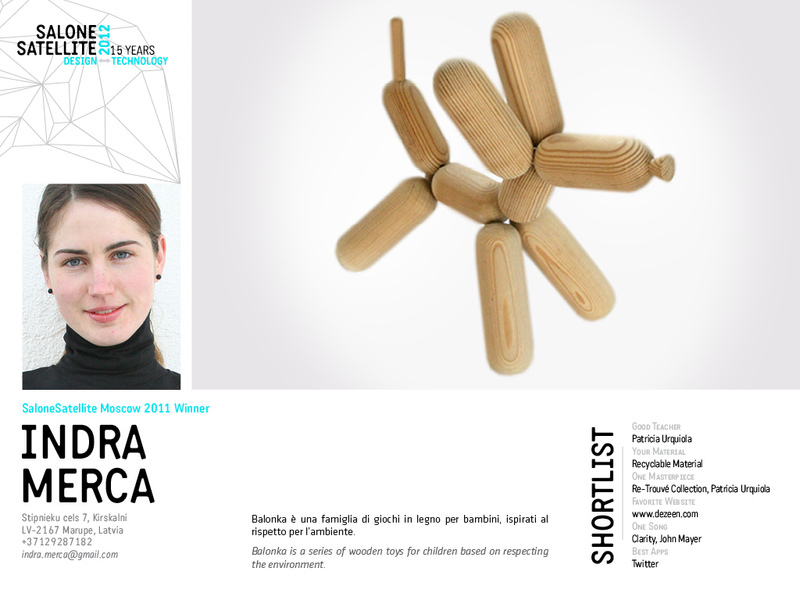 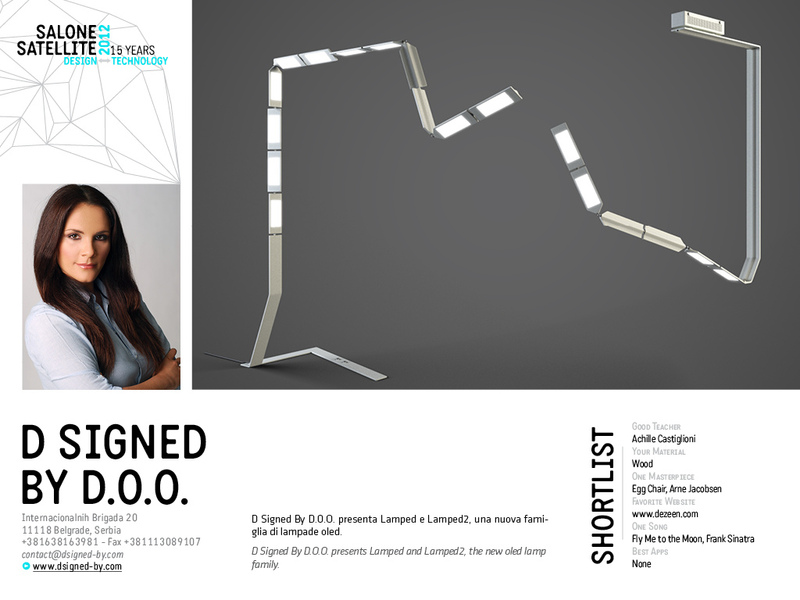 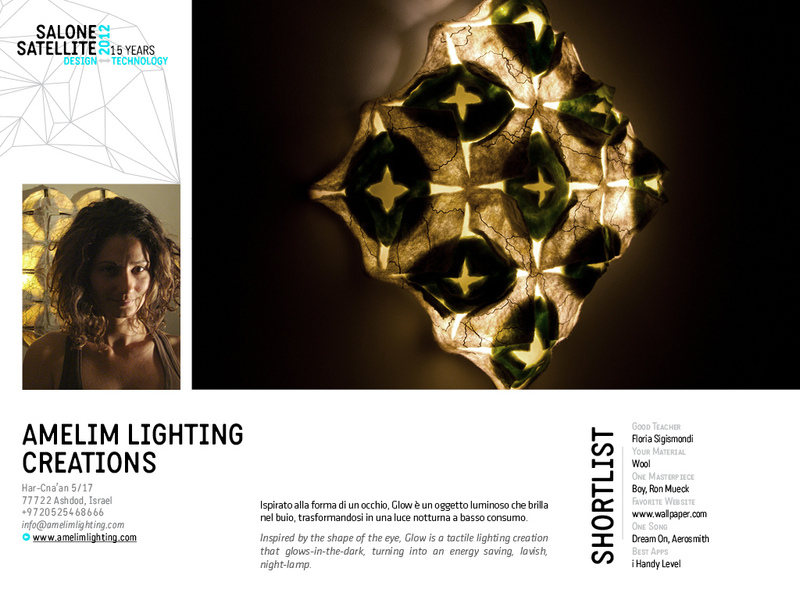 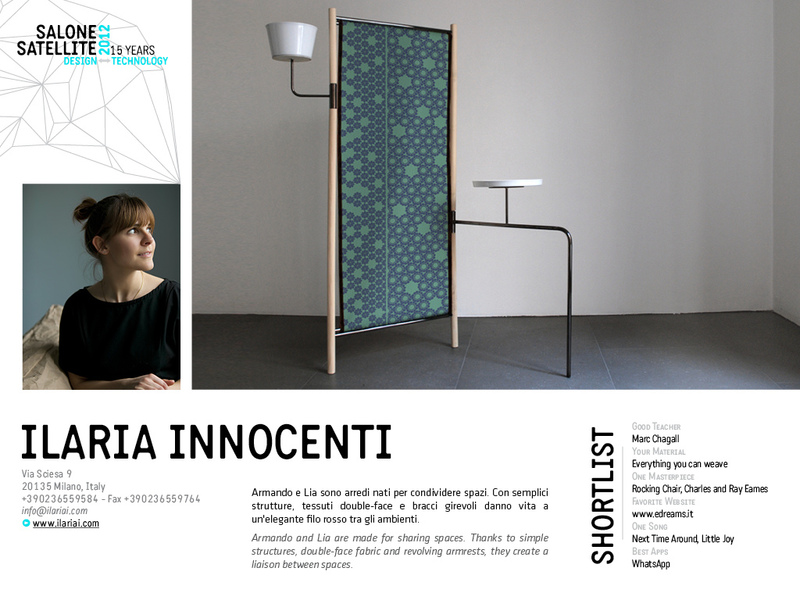 This award is given in recognition of the design development, research and experimentation with biodegradable materials used in the design of this lighting fixture. 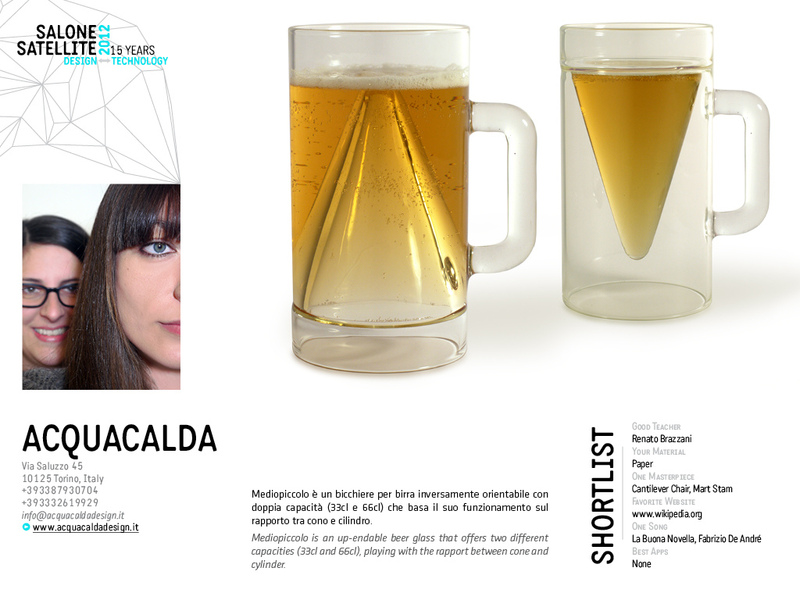 El Botijo Flask – a variation of a traditional Spanish flask that naturally cools water. 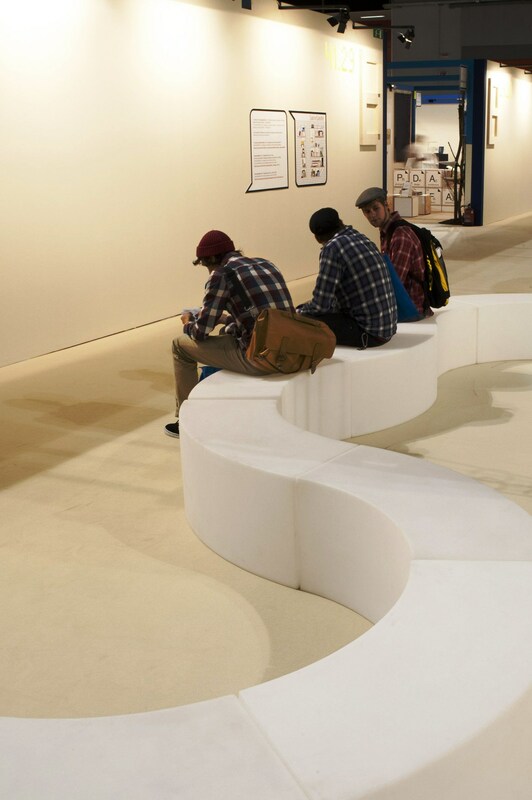 Described as determinedly traditional with a modern twist, this useful and sustainable design is highly commercial. 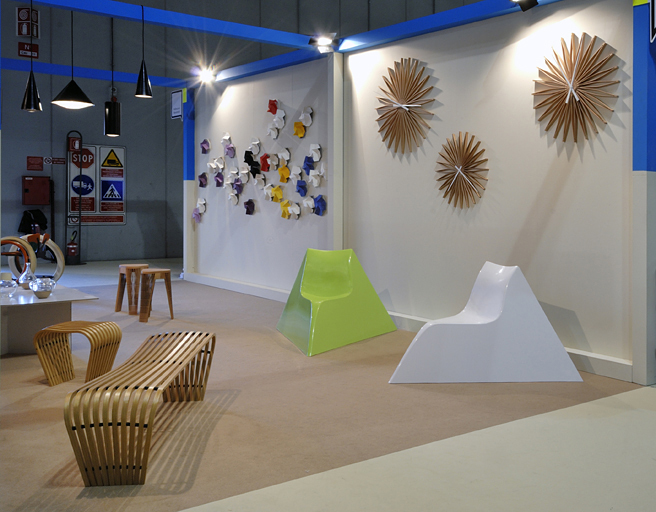 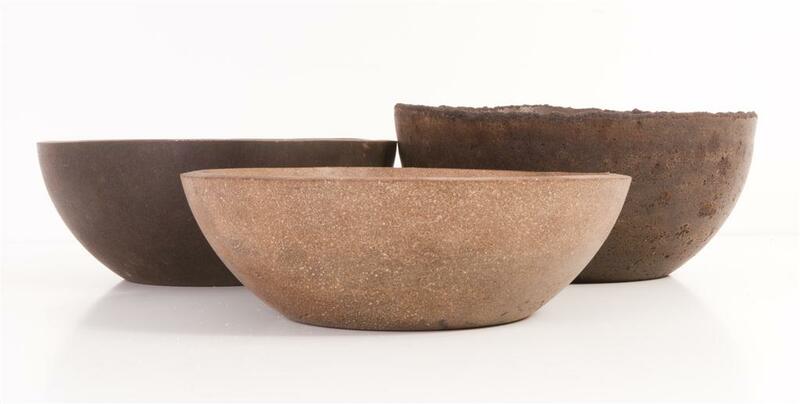 A contemporary take on an age-old shape, the botijo uses an evaporative cooling technique. 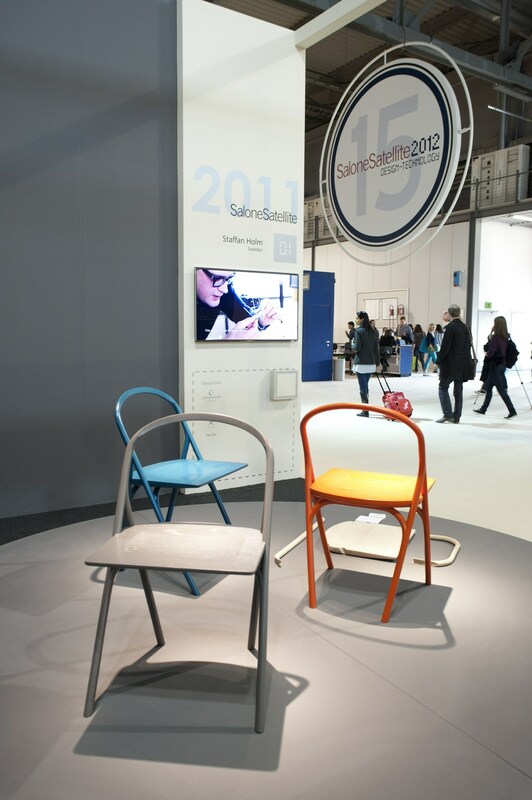 Enamel Table – The bathroom comes to the kitchen in this design which uses an enameling technique that was traditionally used to glaze bathtubs. 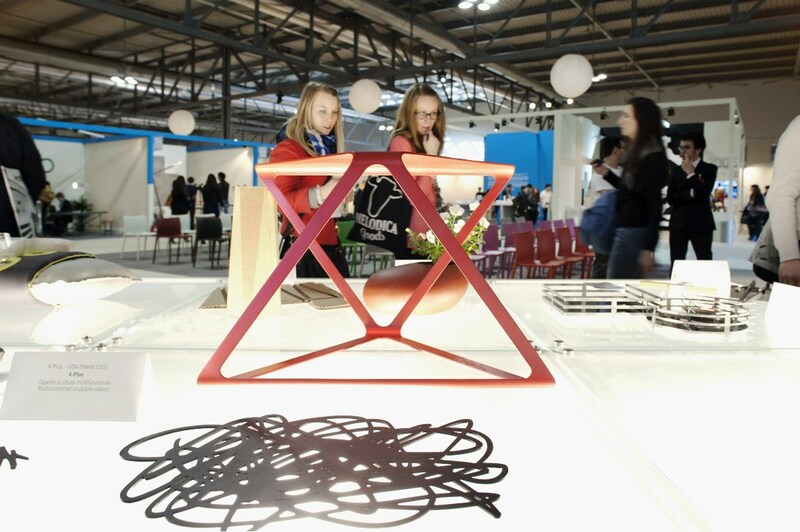 This steel coated enamel table can be used indoors and outdoors. 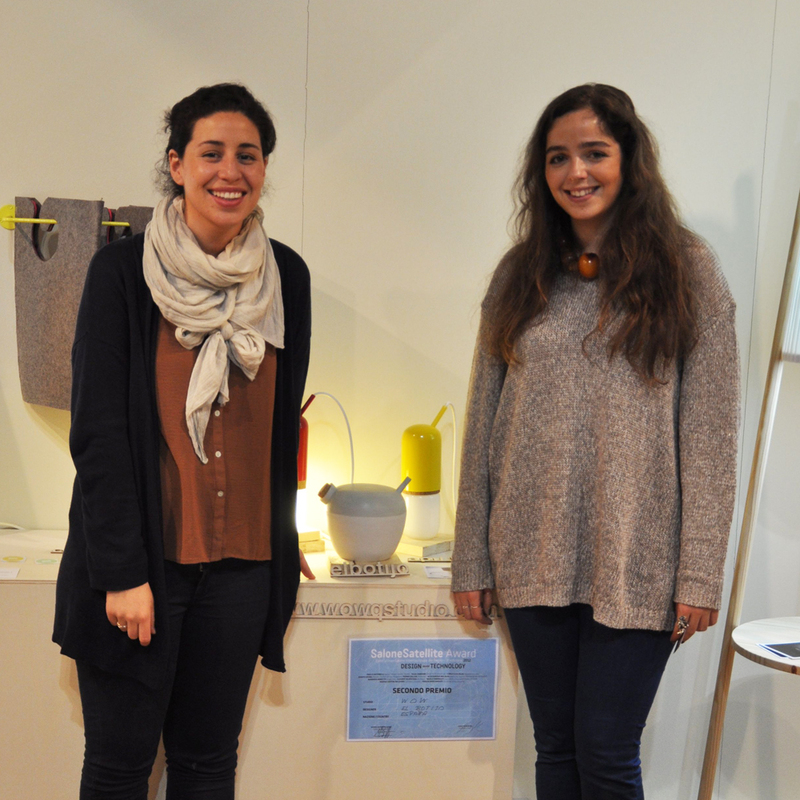 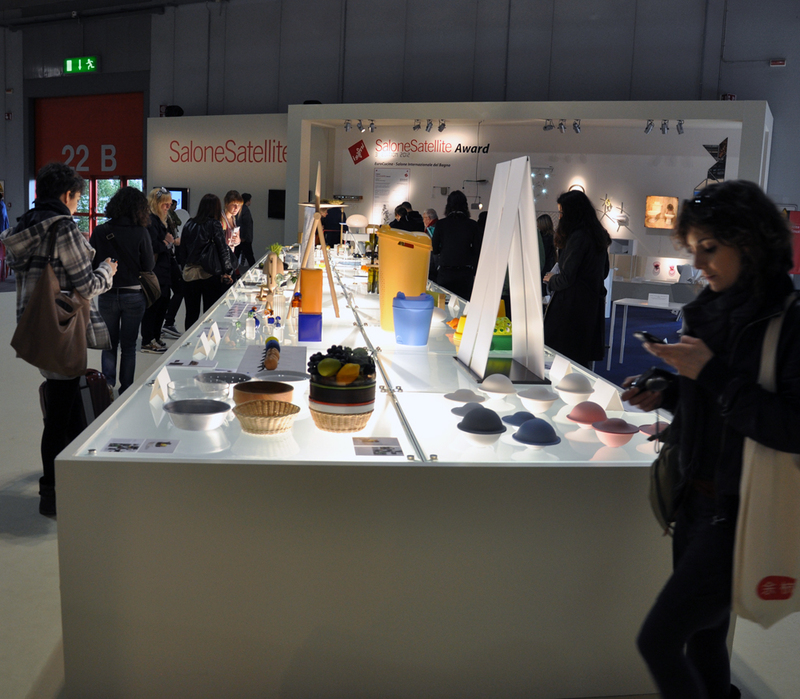 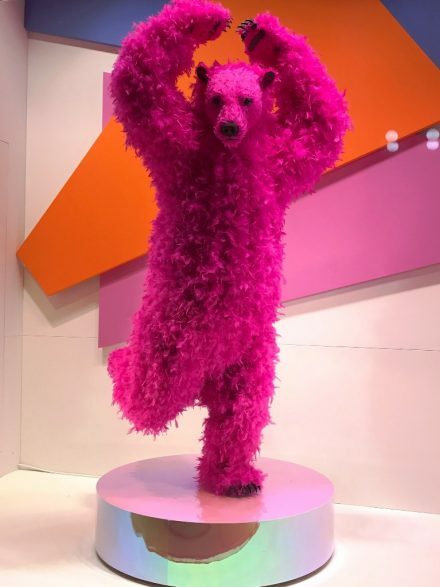 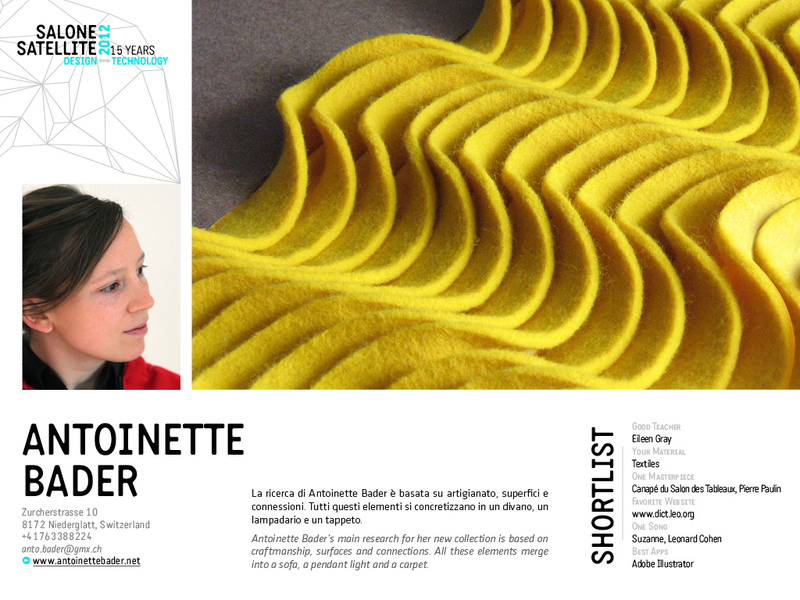 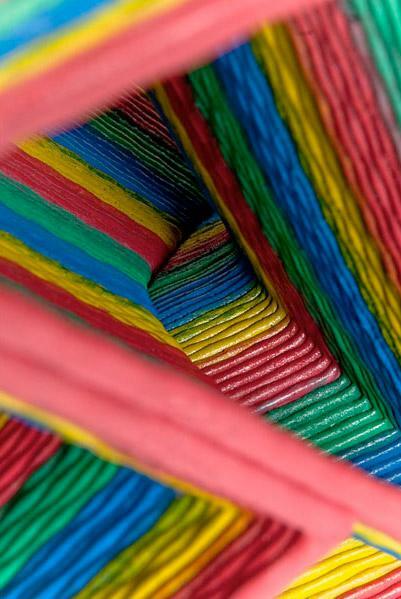 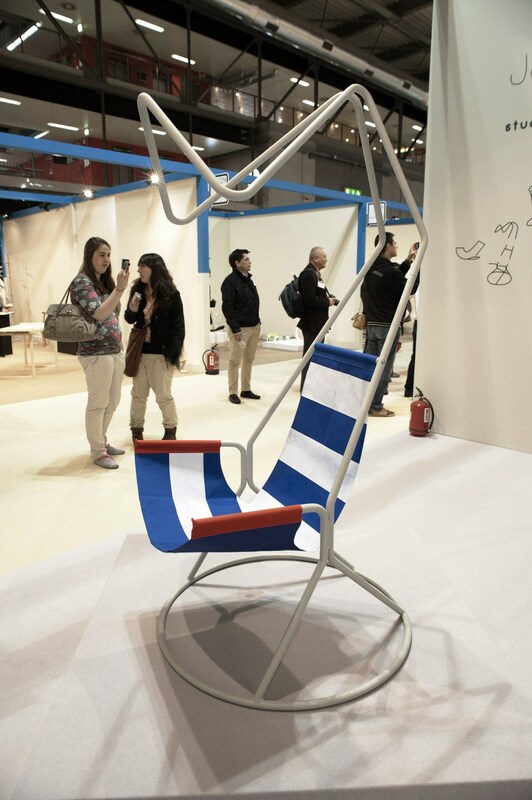 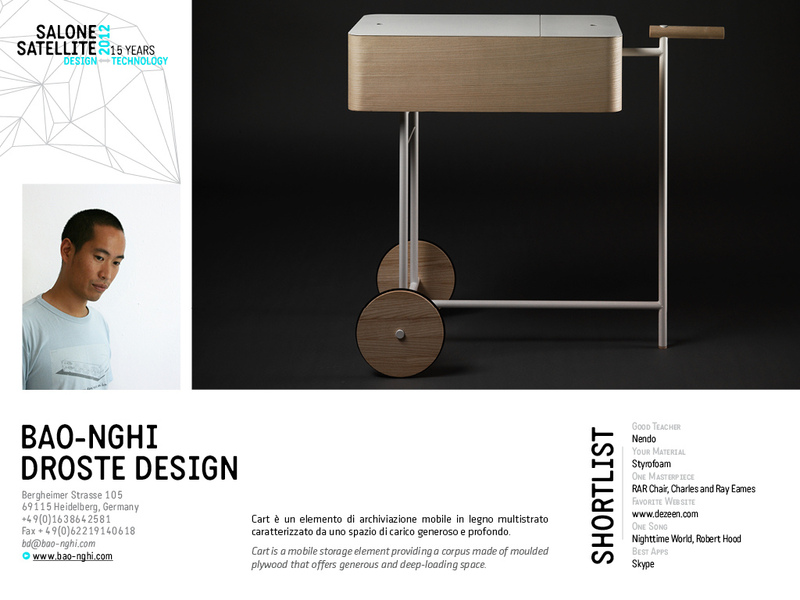 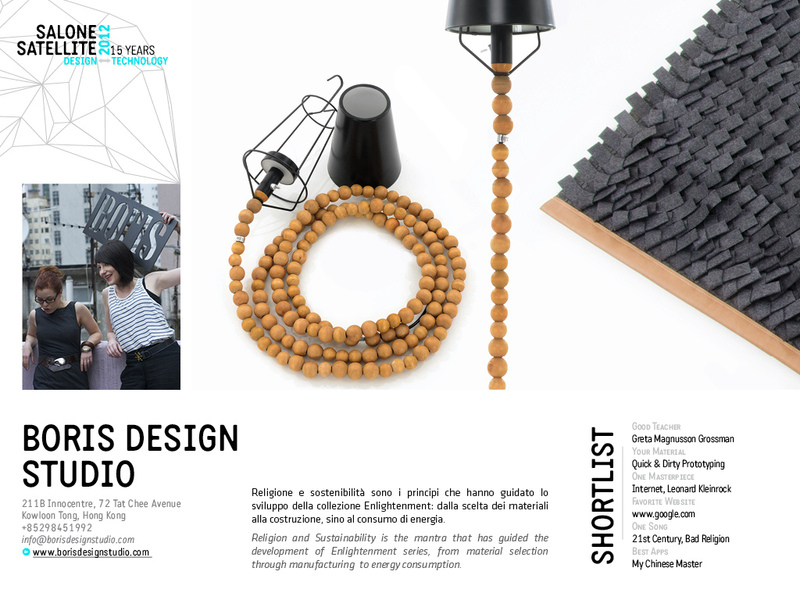 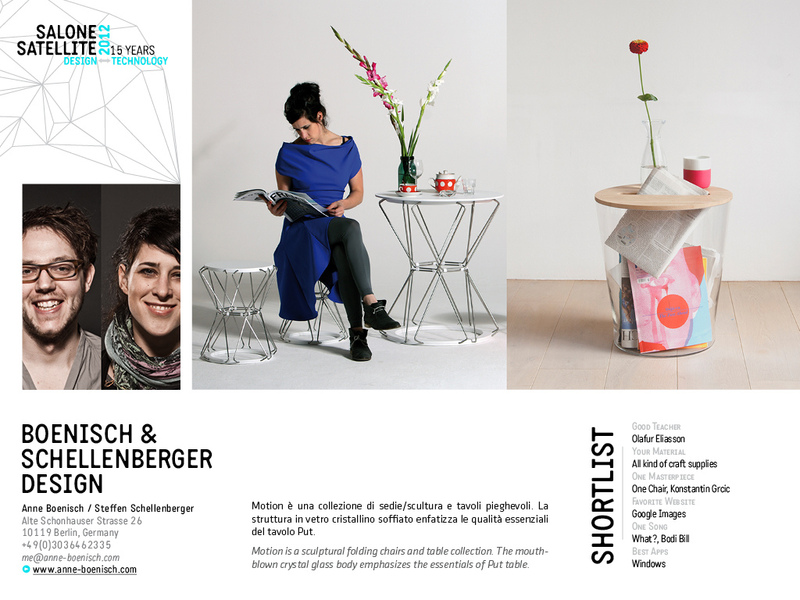 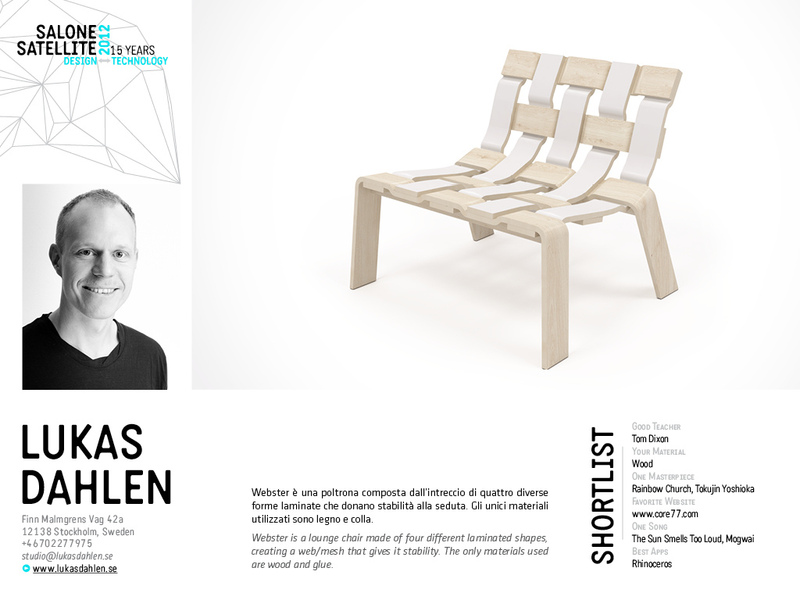 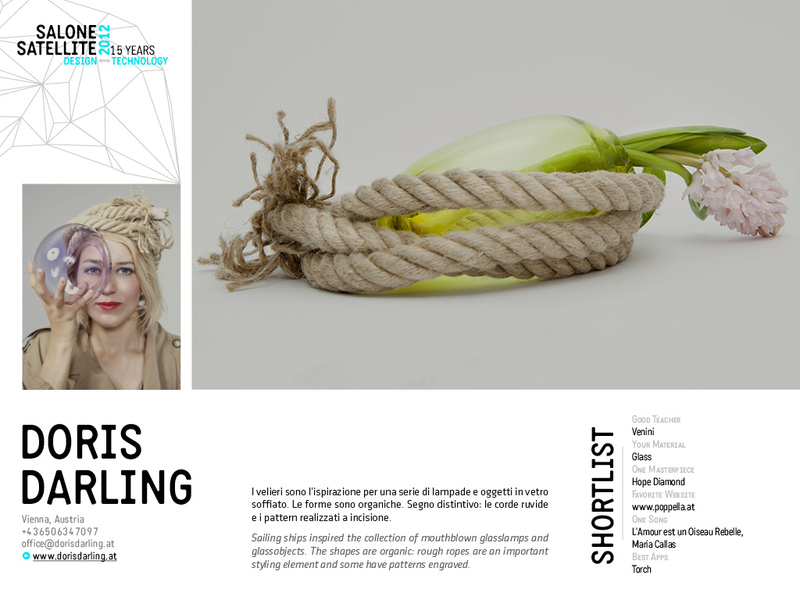 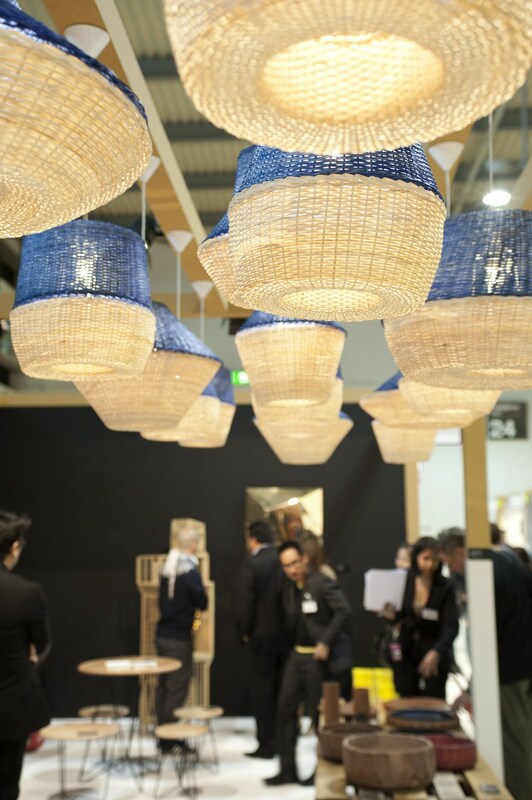 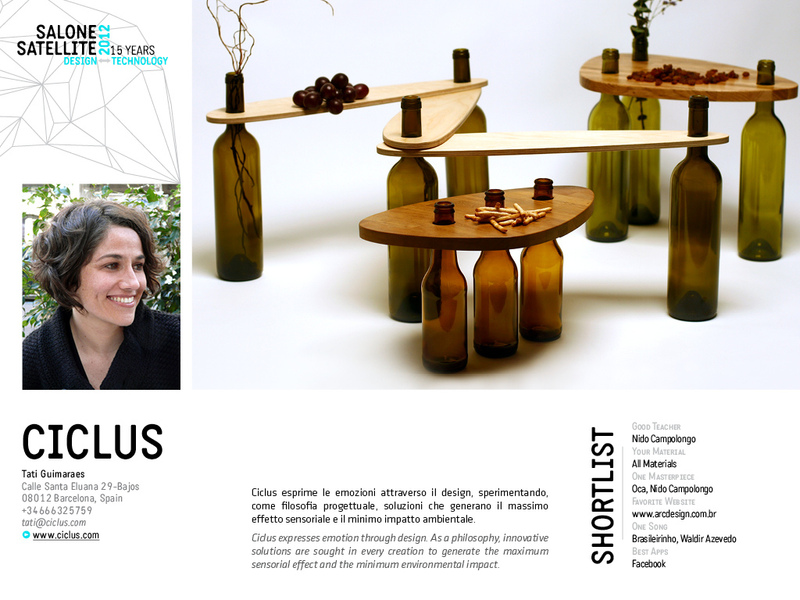 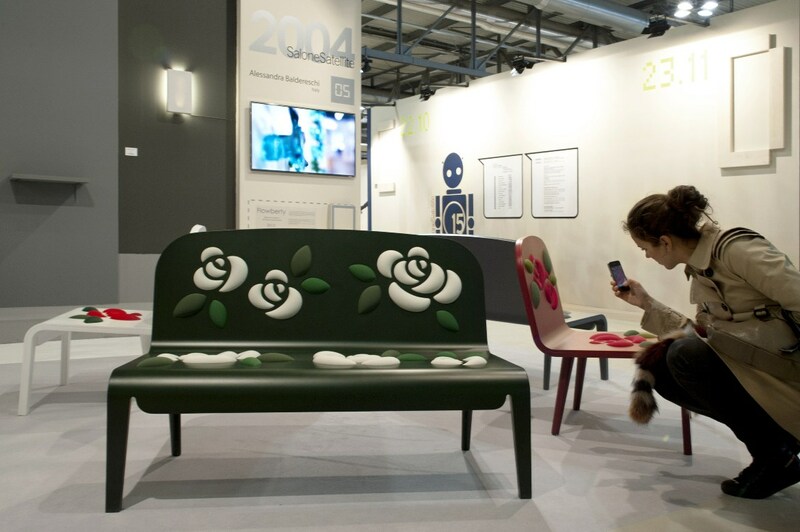 SaloneSatellite: “design, innovation + craftsmanship” responds to the growing need felt by young designers for an integration of artisanal tradition with the new possibilities offered by modern industrial design and production. 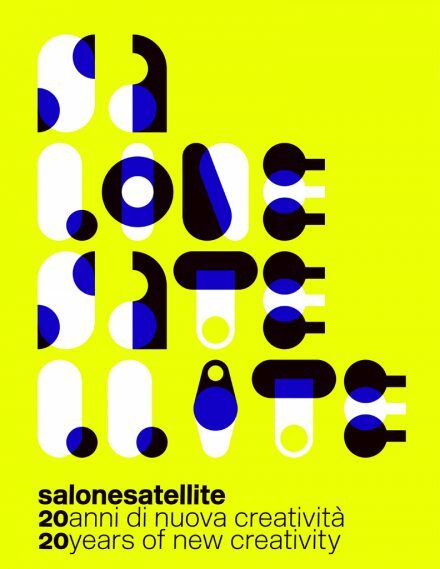 For 17 years, Salone Satellite ( the world’s foremost incubator of design talent ) has been a global point of reference for designers under 35 from all corners of the world who want to be known, as well as for entrepreneurs on the hunt for new talent.